Do you use DeLorme, MapPoint or other mapping software that accepts user-supplied latitude/longitude files? E-mail us for a file of lat/lon for all the swimming holes in this state (specify which software you use). 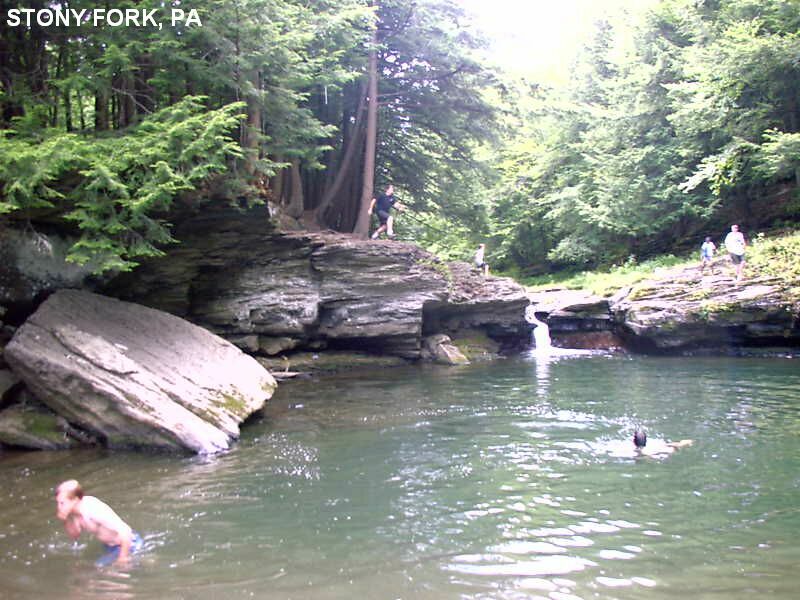 Swimming holes in creeks near Blackwell at the southern end of the very spectacular Pine Creek Canyon (aka "The Grand Canyon of PA") in the Tioga State Forest. If you canoe through the canyon (usually there is only enough water in the early spring), you may end your trip near here at Blackwell. See "DIRECTIONS" below for details. THERE ARE MANY RATTLESNAKES IN THE CENTRAL PA AREA, BE CAREFUL! DO NOT PUT YOUR HANDS OR FEET ANYWHERE YOU CANNOT SEE FIRST, LIKE UNDER A ROCK OR LOG OR ON A LEDGE. SNAKE ALERT . Camp north of here on the rim of the PA Grand Canyon at Leonard Harrison S.P. or Colton Point S.P. or camp south of here at Little Pine S.P. (Little Pine has nicest facilities and swimming beach on lake). The rest is from a visitor:� Look for a dirt road called Elk Run on the left, with a dirt road with a forestry gate across it on the right. Park (park at approx 41.68567,-77.19801) here and walk around the gate. The first half mile or so is on private land but right of way is allowed for hikers and fishermen, just no vehicles. Follow this dirt track past a second forestry gate, for about 3 miles. At this point, there will be a well-defined path on the left of the dirt track into the woods. Follow this path across the creek for another 2 miles. This path will lead down to the top of a 30 foot water fall, with a dramatic ledge hanging out over the falls. There is a path that leads to the bottom of the falls, where there is a deep swimming hole. Just below the falls, Sand Run and Babbs Creek flow together. If you follow the fork of Babbs Creek a ways, there are several other smaller pools and waterfalls. The hike is long, but fairly easy, and I have made it with a 5 and 7 year old many times with no problems. It is the single most beautiful spot I have found in my years of hiking. The trails are easy to follow, so don't let the hike discourage you." LAT, LON (hike to): lat=41.66147, lon= -77.19432 (source: map) (accuracy: approximate) LINK TO GOOGLE MAP. Very confident. Not verified. Updated 2/2013. 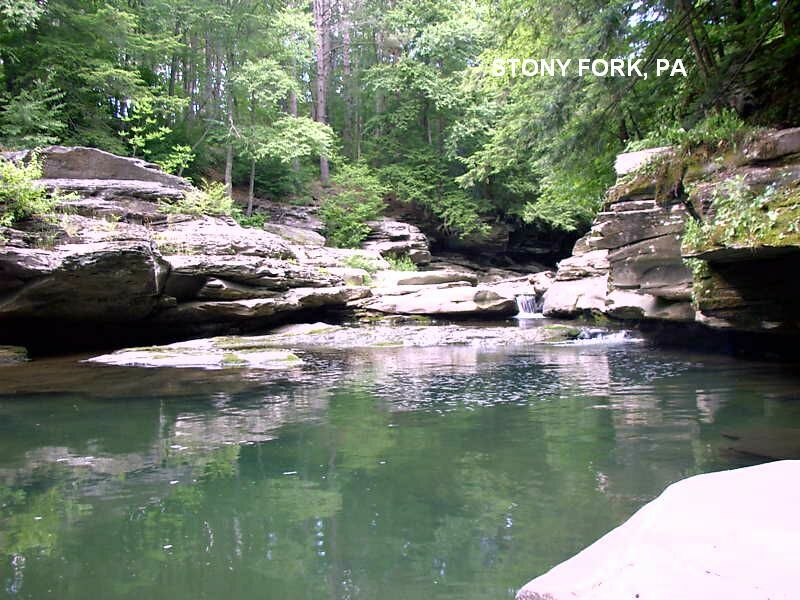 STONY FORK [STON]: Several very scenic swimming holes in Stony Fork Creek. PHOTO 1 , PHOTO 2 , PHOTO 3 , PHOTO 4. 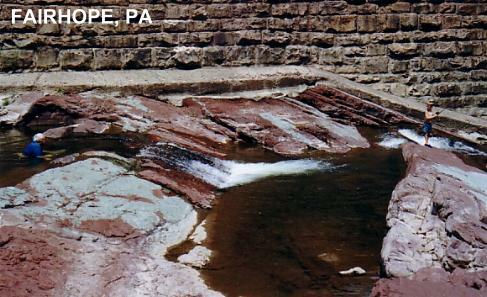 This description from a visitor in 2007:" At Little Falls, Stony Fork PA, the depth of the water here in the summer during the hot season is 7-10 feet deep. Great place for swimming, must be careful jumping because there are two large boulders in the water that are larger enough to stand on in the middle and keep you above water. Within 30 feet of Little Falls, downstream around the bend is another deep pool 6 to 8 feet deep during the summer season. From where the pull off is for Little Falls, go down the road less than a half a mile (actually, about .1 miles) and there is a steep trail that goes over the bank. At the end of this trail is the prime jewel of the creek. Big Falls, Stony Fork PA. YOUTUBE . It is a deep azure colored hole whose depth is much debated." (see what you think it is.) "People jump off the tops of the pine trees around the hole into the water and never touch bottom. No one ever has". (or so it is said...)"
Bathing suits may be optional. 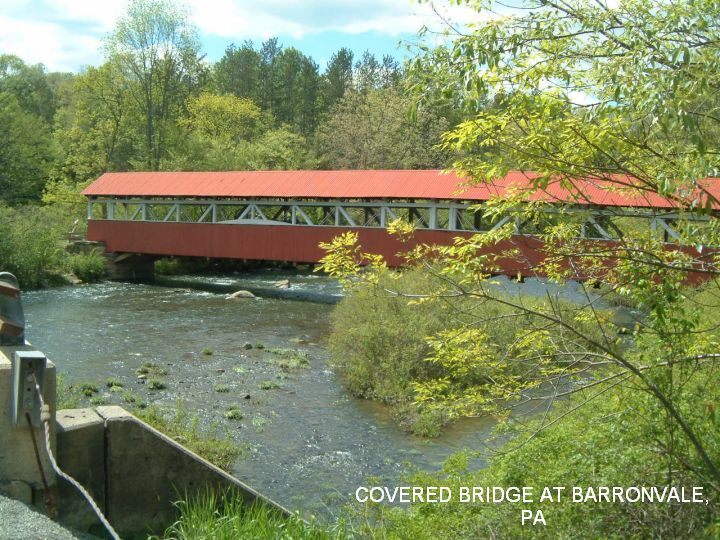 To get here from Wellsboro, go south on RT 287 about 6 miles (past the turn off for Sand Run Falls) to Knapp then take SR 3008 (Betsy Ross Rd) west (right turn) to town of Stony Fork. In Stony Fork, go south on SR 3007 a short way to Draper and take the fork that goes off to the left (set your odometer here) this is no longer RT 3007, this is now Stony Fork Rd. Continue south on Stony Fork Rd, it becomes dirt, through a little area called Paint Run (see wooden building on left that says "Paint Run" on sign) a total of 4.8 miles where there is a pull-out on the right - park here. Follow the wide, obvious trail from this parking spot upstream to where the falls is. One swimming place is at the foot of this falls. There are several other falls and swimming places along this road. LAT, LON [NAD27]:lat=41.595,lon= -77.352 (source: measured-p) (accuracy: approximate) LINK TO GOOGLE MAP. Very confident. Verified 6/07/05. Updated 1/29/08. RATTLESNAKE ROCK [RATT]: Swimming hole in Pine Creek below large rock. Busy place, boat launch spot, fishing place, access to West Rim Pine Creek Canyon Trail, huge parking, toilets. PHOTO . To get here from Wellsboro, go south on RT 287 (past turn off to Stony Fork above) to Morris then take RT 414 west (right turn) to Blackwell (south end of Pine Creek Canyon). Continue through Blackwell on RT 414 a short distance where you can't miss seeing on the south side of road (left side) a very large parking area and a sign "Rattlesnake Rock". Park and take the foot path (not the boat launch road) across the West Rim Trail and down to Pine Creek. You will be at Rattlesnake Rock and the swimming place is here. May be jumping. Bathing suits customary, very busy place. LAT,LON lat=41.5405,lon= -77.406 (source: measured) (accuracy: exact) LINK TO GOOGLE MAP. Very confident. Verified 6/07/05. Updated 6/09/05. 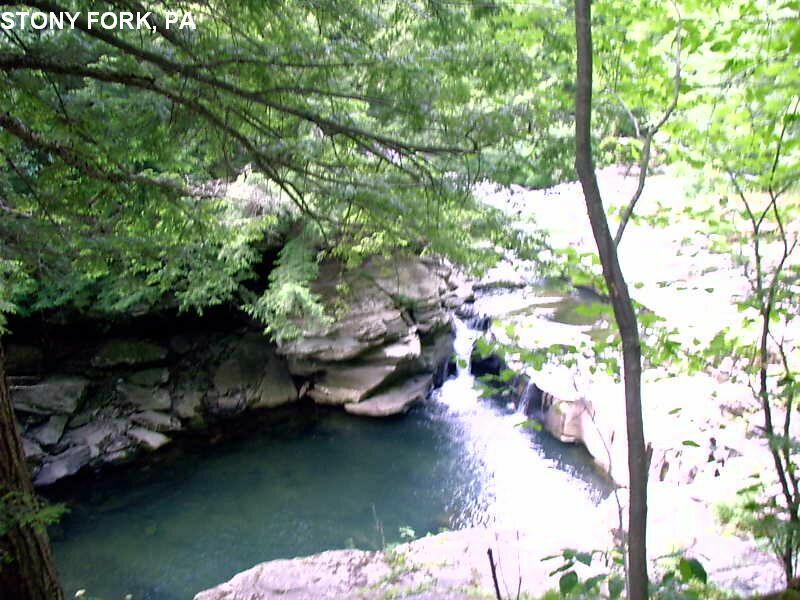 CEDAR RUN [CEDA]: Nice little swimming hole at foot of a small flat-rock falls where Mine Hole Run empties into Cedar Run. PHOTO. To get here from Blackwell (above), continue west on RT 414. Just before you get to the town of Cedar Run, take a very sharp right (north) turn on Leetonia Rd. (RT 3001). 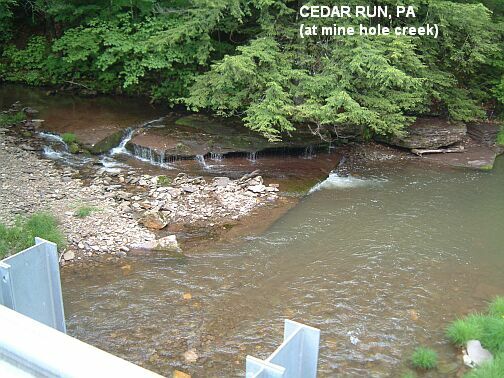 You will be running along Cedar Run - go about 2.3 miles to a small bridge where Mine Hole Run comes in. The swimming hole can be clearly seen from this bridge. Park before the bridge and take a rather indistinct (but short) trail down to the swimming hole. 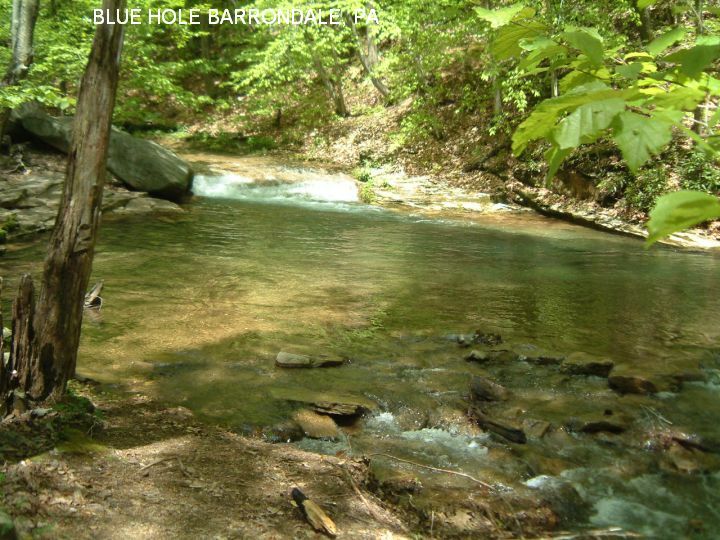 If you walk up the road to the right, the one that parallels Mine Hole Run, about 300 feet, then go down to Mine Hole Run, you will be on the edge of a little ravine where the creek rushes down chutes and falls in to a pool. Very pretty and possibly a swimming place IF you can clamber down the steep banks and IF is appears safe to swim there. LAT,LON lat=41.5558,lon= -77.4583(source: measured) (accuracy: exact) LINK TO GOOGLE MAP. Very confident. Verified 6/07/05. Updated 6/09/05. 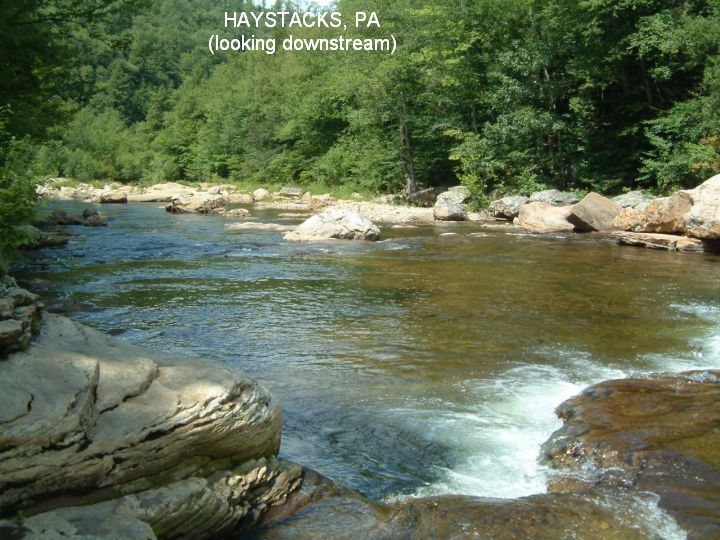 FAHNEYSTOCK [FAHN]: Swimming hole in Cedar Run upstream of Cedar Run hole (above). To get here from the Cedar Run Hole, continue north on Leetonia Rd. (RT 3001) about another 2 miles to the Fahneystock Road. There is a nice swimming hole just upstream from this intersection. (Another 2 miles would bring you to the Village of Leetonia.) LAT,LON lat=41.57815,lon= -77.47293 (source: map) (accuracy: approximate) LINK TO GOOGLE MAP. Pretty confident. Not verified. Updated 2/2013. MANOR FALLS [MANO]: Swimming hole in a bathtub-like (locally called "The Bathtub") 6 foot deep pool at the top of Manor Falls on Slate Run. LINK TO PHOTO. To get here, continue south on RT 414 to the town of Slate Run. Cross Pine Creek at Slate Run then turn right on Slate Run Rd. and see the Hotel Manor near this corner. Park somewhere near here (don't know where you can park exactly). Take a steep path down to Slate Run creek and then about a 10 minute hike upstream to a great waterfall. The bathtub is at the top of the waterfall. Even a high rope to swing from if you dare. Families love it! LAT,LON lat=41.51205,lon= -77.53541 (source: map) (accuracy: approximate) LINK TO GOOGLE MAP. Pretty confident. Not verified. Updated 2/2013. 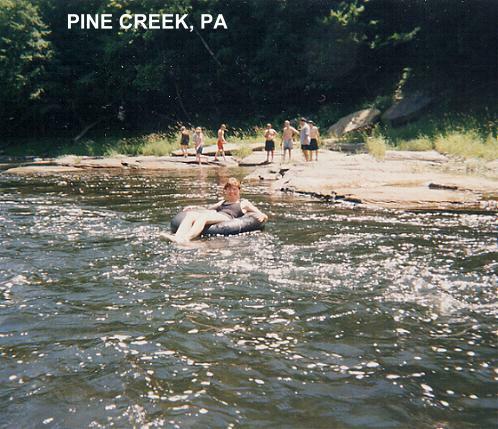 LITTLE SLATE [LITS]: Swimming hole where Little Slate Run enters Pine Creek. To get here from RT 212 at the town of Slate Run, cross Pine Creek at Slate Run then turn immediately left (south) on Naval Run Rd and go about .5 mile to where Little Slate Run enters Pine Creek. 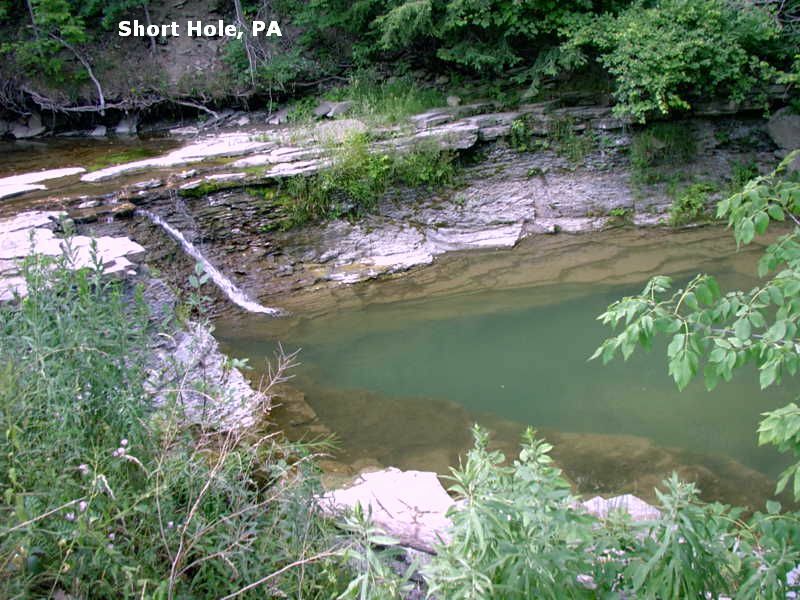 There is a deep swimming hole at the point where Little Slate Run joins Pine Creek, LAT,LON lat=41.46421,lon= -77.50546 (source: map) (accuracy: approximate) LINK TO GOOGLE MAP. Pretty confident. Not verified. Updated 2/2013. Beautiful, small, crystal-clear swimming hole in scenic setting. From Pittsburgh, take I-70/76 (PA TPKE) east to the Somerset exit. From the Somerset exit, take RT 31 (W. Main St.) a short way west then RT 281 (New Centerville Rd.) southwest (through New Centerville and New Lexington) about 10.5 miles to Barronvale (the road is now called Scullton Rd.). In Barronvale, take Ream Rd. north 1 mile then jog right on Covered Bridge Rd. then quickly left on Fall Run Rd. 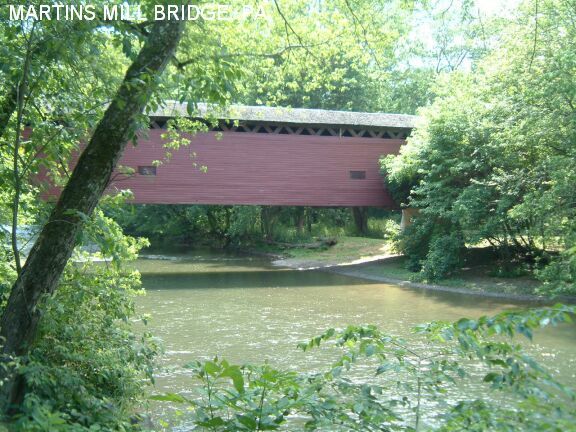 (Here is a picture of the covered bridge . Go about 1 mile on Fall Run Rd. then turn right on Blue Hole Rd. (a definite clue) (gravel). Go about 1.3 miles on Blue Hole Rd. and ... guess what... a beautiful blue hole on the right. 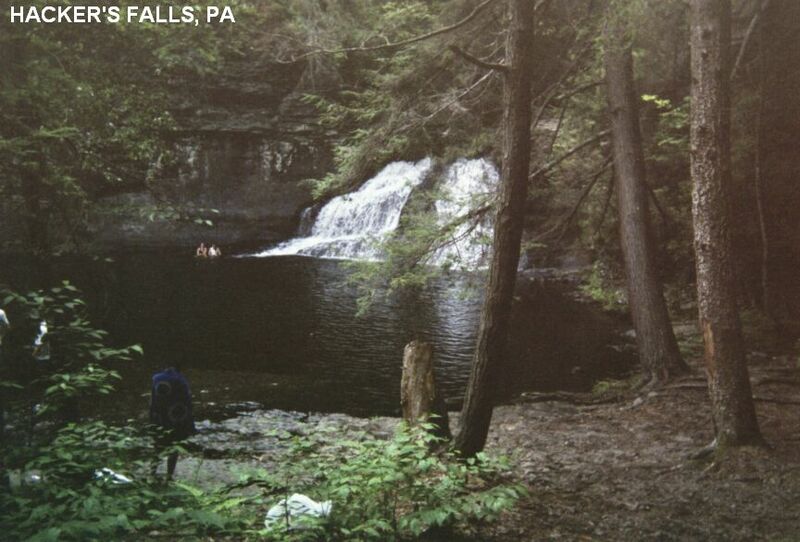 A swimming hole at the bottom of a 40 foot falls in a small scenic area. 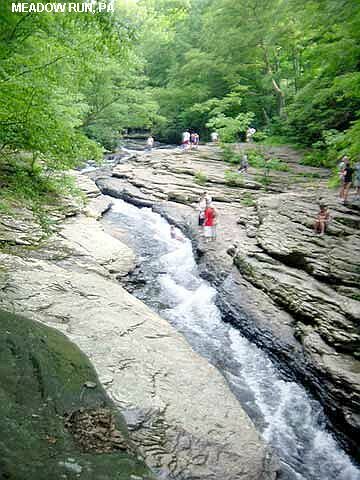 There are several "Buttermilk Falls" in PA. This one is also known as "Homewood Falls". Beneath a railroad bridge and very close to the PA Tpke. Not exactly a bucolic setting but a nice little stop in a small natural area off the turnpike. From I-76 (PA Tpke) take exit 13 (new Beaver Falls) and go south on RT 18, cross under I-76 and there is a sign for the natural area on your right. Park in the parking area and take short walk on trail to falls. 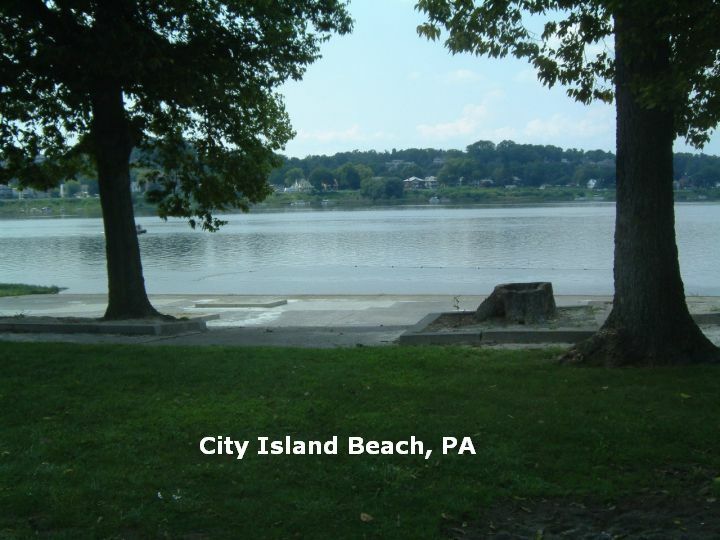 City Island Park is a Harrisburg City park in the middle of the Susquehanna River reached by both foot bridge and auto bridge. It has some arcade facilities, snack bars, a ball park and is nicely developed and landscaped. 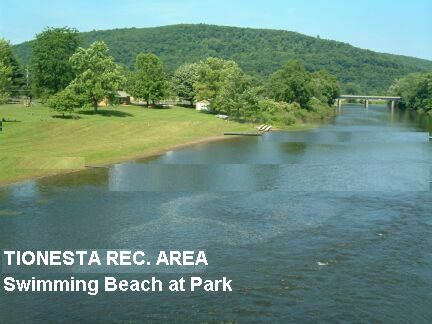 It also has a rather uninviting swimming beach on the Susquehanna River. The swimming beach is basically a concrete apron leading down to the river and seems to be very little used anymore. There appear to be no lifeguards. There is no fee. LINK TO WEB SITE. LINK TO DIRECTIONS. You will need to walk a short way to the swimming area which is at the northernmost tip of the island. Tubing and swimming place in Conococheague Creek right in the town of Chambersburg. Definitely not a scenic setting - it right behind a chain link fenced parking area and industrial storage area. 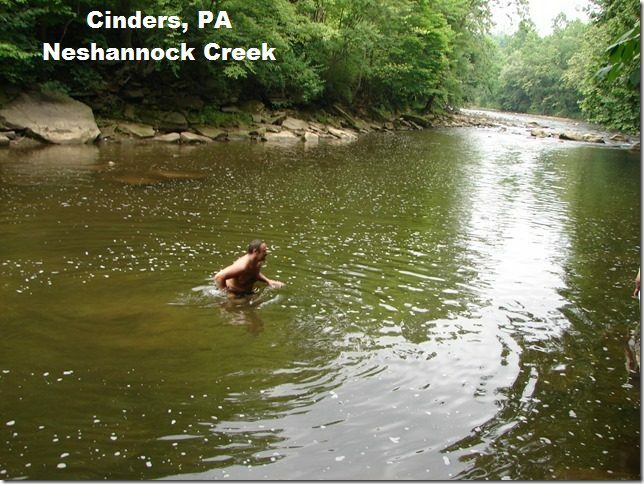 Here's a report from a visitor who didn't think it was a very nice place:� I visited the conococheague creek (cono) swimming hole in Chambersburg, PA on 8/13/06 and sadly report that it is not in very good shape. The river has a sulfuric (read polluted) smell to it, and has a milky color. The watering hole appears well-used, but by that I mean well-littered - clothing, cans and bottles litter the shore and are floating in the water. Where the water was shallow, we could see that the river bottom is covered in silt. We saw several fish in the water so it might not be THAT bad, but we decided to wade in the crystal-clear river at the nearby Caledonia State Park." None at site; Pine Grove Furnace, east of here, has camping and lake swimming. From Hagerstown, MD go north on I-81 to Chambersburg, PA. 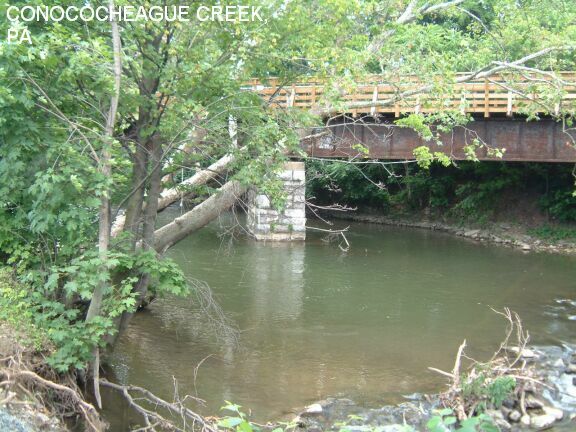 The Conococheague Creek goes right through Chambersburg and has many swimming and tubing places. One place: In downtown Chambersburg, going west on RT 30, after you cross RT 11 and go over small bridge, see the Texas Lunch Family Restaurant and a parking lot on your left (south side). (There may also be a sign for the restaurant and another parking lot across the street, to your right, on the north side. You want to walk though the parking lot on the left or south side of the street.) Park here and walk through the restaurant parking lot. There is an old piece of railroad trestle (now a pedestrian bridge) that spans the creek and a path next to it that leads right to a swimming hole (go around behind the chain link fence) with a rope swing. At site; Cook Forest S.P. 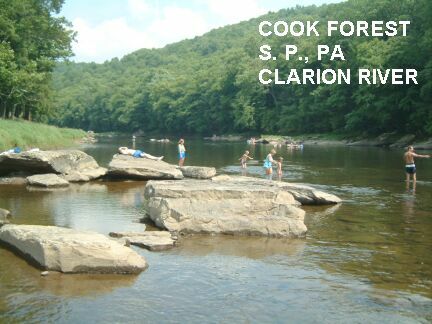 From I-80 east of Clarion at Brookville (Exit 78), take RT 36 north about 15 miles to Cook Forest S.P.. 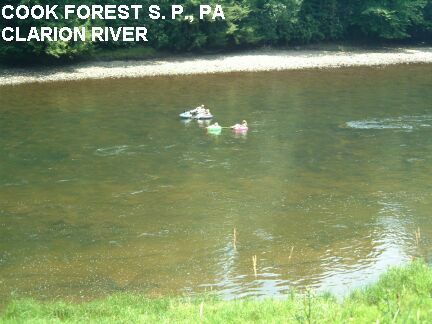 In the State Forest, drive along the Clarion River, park (legally) grab a tube and jump in! Small waterfall deep in the woods with fine swimming hole at bottom. This from one happy user: "Cliffs to jump and dive off of, you can even swim up behind the falls and they spill down onto your shoulders! This place was very secluded for sure! It is a little hike (think long and hot in summer) about 15 minutes I think! I will find this place this summer and try to give you better directions...it is tough...I've been there a dozen times and still get lost every time!" 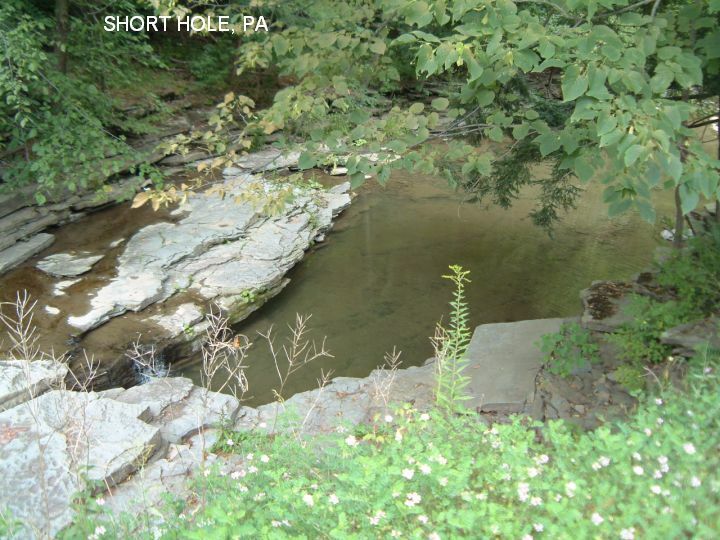 This (more recently) from another happy user: "Small waterfall deep in the woods with fine swimming hole at bottom. The waterfall is accessible by a short hike along railroad track or along a rugged dirt road passable only to off road vehicles. When we visited, some people on dirt bikes and jeeps arrived. The site had some problems with graffiti, litter and broken glass. Nonetheless, it was a very nice swimming hole with a deep pool and great cliffs to jump from." And another report:� It was a pretty good spot. Total mileage was about 50 miles from Pittsburgh, took about an hour to get there. Scottdale is the closest town, pretty tiny rural community. Some organization/club was raising money so they were selling hoagies on the street corner at the main intersection of the town. And they were HUGE hoagies, at least a foot. From there, just a few miles on small roads, then a turn down a gravel road. A railroad runs essentially along the creek, so once the gravel road becomes a total off-road "road," you can park and climb up on to the tracks for an easy walk -- or hike along the creek/off-road till you get to falls. Not sure if the jeep would make it. Apparently it's a hot spot for locals to ride quads and dirt bikes, and we saw a bunch of folks out for a ride. Several spots were pretty tough for the quads, and you can see where the path/road has sparked off into little alternate routes because the wear/weather/etc has torn up some pretty deep trenches. It was definitely a climb/scamper as well as a walk, not a simple hike. So that was pretty fun." "In addition to ourselves, a few groups of high school or college age kids came down and were "cliff jumping" and swimming and goofing off. Some of the quad riders stopped down at the falls for a few minutes to hang out. The water level was really low, and I'd say the falls were sort of a 2- or 3-section tiered fall, first about 5 or 6 feet, then a longer 8 or 10 foot drop. You could jump into the water from any of a number of rocks at different heights. The highest jump was probably a 25 foot plunge into the water, which was pretty sweet. Lots of trash. BROKEN GLASS everywhere, so barefoot was not a good idea. It was definitely a remarkable amount of glass, so that was the one negative quality. It would be impossible to ruin the location, though, since it was such a prime little swimming hole. Definitely worth revisiting!" 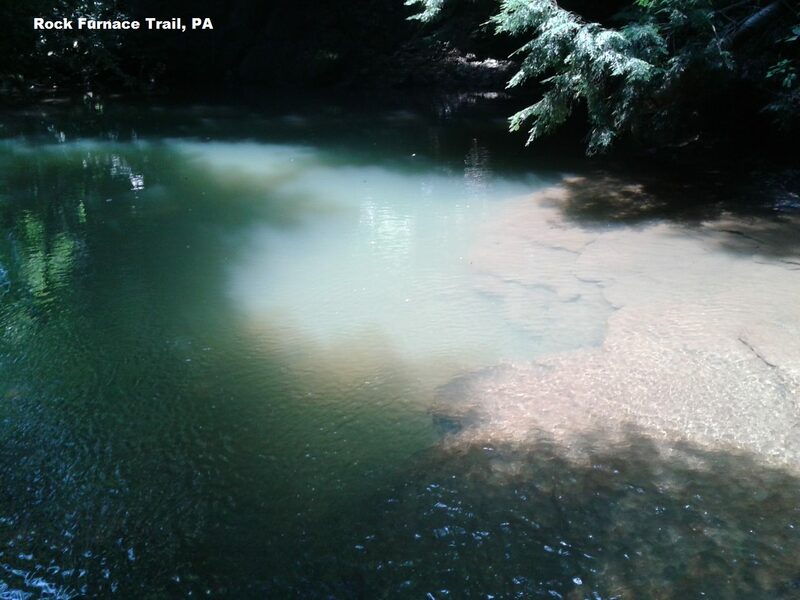 Note: Swimming is not permitted under PA State Game Lands regulations. At Ohiopyle S.P. southeast of here. Get reservations if it is rafting time. From Pittsburg, take I-76 southeast to Exit 8 then RT 119 south then RT 819 southwest into Scottdale. In Scottdale, take SR 3002 west about 1 mile then go left on Creek Rd.. Follow Creek Rd. about 3 miles to Chaintown. At the bridge in Chaintown, there begins an unmarked gravel road that goes west along Jacobs Creek. (NOTE: there is no TOWN to Chaintown. The bridge is a railroad bridge on a secluded country road. Don't expect any stores or a post office). This road gets very rough and is passable only to off road vehicles. At one point the road fords the stream. You can park and walk up the road or you can follow the railroad tracks. The swimming hole is about 300 yards downstream after the tracks cross the stream the second time. This from a fan:� There is actually a complex of three swimming spots here. 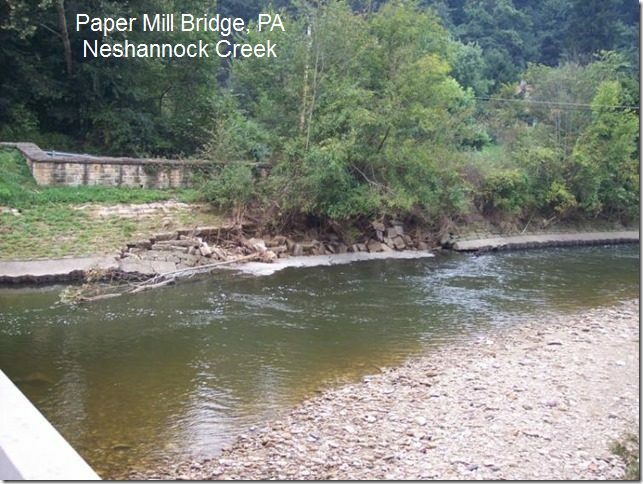 The first one is on the Stonycreek River right upstream from it's confluence with Paint Creek. This spot has a single lane bridge that can usually be jumped from. 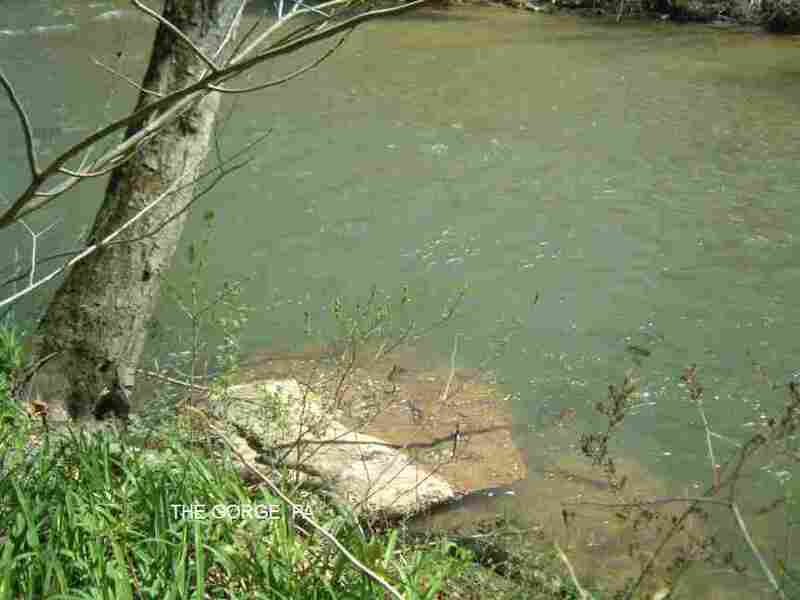 This area is private property that is open to the public and serves as a canoe/ kayak launch." "The next two awesome spots are up on Paint Creek. They are accessed by the same parking spot as for Stonycreek River swimming hole above. You walk up Cottage Lane about 1/8 mile to the first spot known as the "Cliffs". 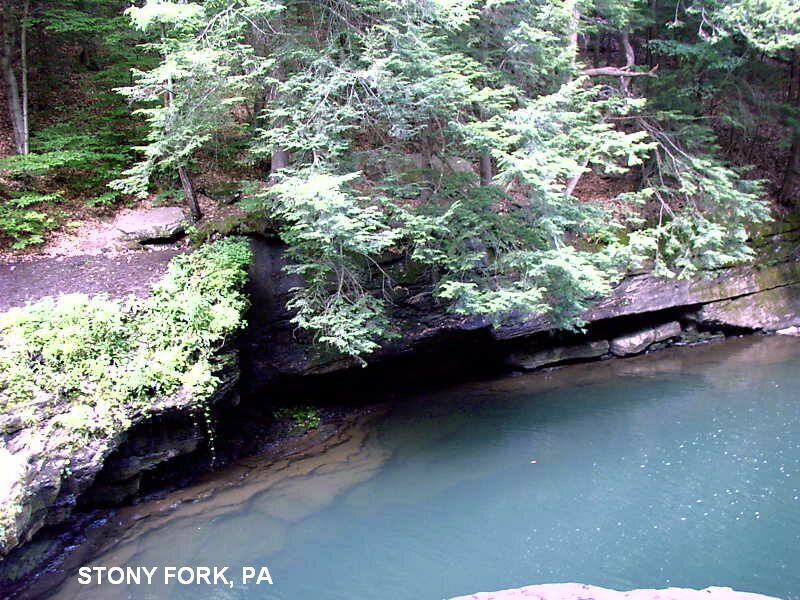 This swimming hole has about 8-10 foot cliffs to jump from along with a waterfall. Even in August the water is plenty deep." "There is a trail that runs along the creek that can be followed either back down to the parking area or up a few hundred yards to the next swimming hole known as the "Falls." This spot also has a waterfall and 8 foot cliffs to jump off of. You can also slide down the falls into the deep water. This hole is also deep all year long. If it is hot out there are usually others there and finding the swimming holes shouldn't be difficult. Be careful of broken glass." Lorain County Park just south of Johnstown. On RT 219 south of Johnstown, get off at the Davidsville exit and go north on Route 403 (Main St). Go through the town of Davidsville (taking turns to stay on RT 403) and past the elementary school (RT 403 becomes "Tire Hill Rd.). About 2 miles past Davidsville, turn right on Carpenter's Park Road. Follow Carpenters Park Rd. as it curves sharply right and, about 1.5 miles from RT 403, turn left to stay on Carpenters Park Rd..
Keep driving and you'll go over Route 219 and start down a steep road. You'll cross the single lane bridge that is the swimming hole. The parking is adjacent to the bridge. 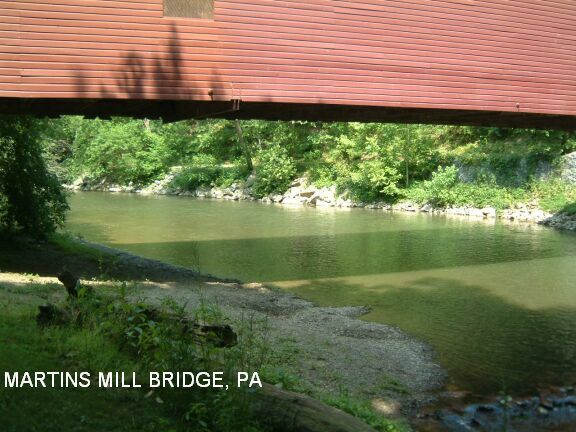 Park here at the bridge and walk to the above-described 3 swimming holes. (If you kept going you would be on Cottage Lane where parking is very tight). Jumping, swimming place in creek. Please treat this place lightly. It is heavily used and suffers from an abundance of trash at times. This swimming hole is on private property and the burden of cleaning up the area falls on the property owner. If every visitor picked up just one piece of trash, the problem would be solved faster than one would think. You can make a difference! From Milford, PA, take RT 6 north/west to Hawley, which is near the north end of Lake Wallenpaupack. 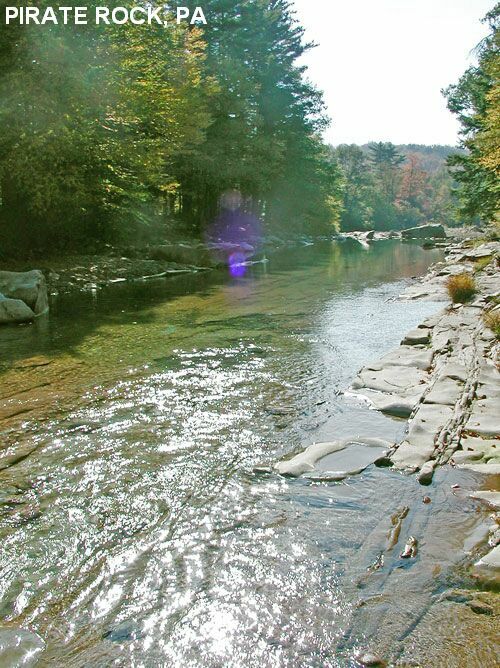 In Hawley, take Pike St./Cromwell Ave to the east, across Wallenpaupack Creek. Just after you cross the creek, park near a hotel called "The Ledges". Hike for about 20 minutes, following the ridge line, until you find the pool. From their web site www.dutchsprings.com "Dutch Springs Diving and Recreation Facility features a 47 acre freshwater lake which has been set up specifically for SCUBA diving with underwater platforms, submerged vehicles, aircraft, and other sights to see, and a variety of interesting fish life including rainbow trout, palomino trout, largemouth bass, bluegills, carp, and goldfish. 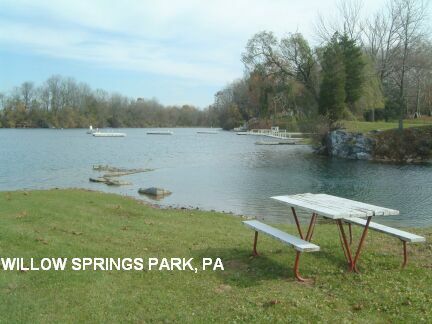 For non divers, Dutch Springs is a place for picnicking, boating, swimming, and snorkeling." From Philadelphia Area, go north on Northeast Ext. to Lehigh Valley Exit; RT. 22 East to RT. 191 North. See web site for more directions. This one is for the explorers - we really dont know where it is but we know it is thereabouts and it is almost 11 feet deep. See directions below. Please tell us if you find it. Go to Troxelville which is northwest of Harrisburg. Take Timber Rd. north then Swift Run Rd. west. This road parallels Swift Run and the swimming hole is somewhere along here. Maybe a short hike down Jacks Mountain Fire Road, not sure. No better directions. 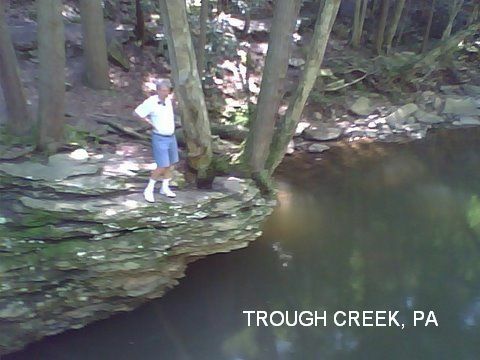 Huge rock outcropping over deep creek for jumping and swimming. See directions below. Please tell us if you find it. In N. F. campgrounds just north (Dew Drop) and south (Kiasutha) of here. 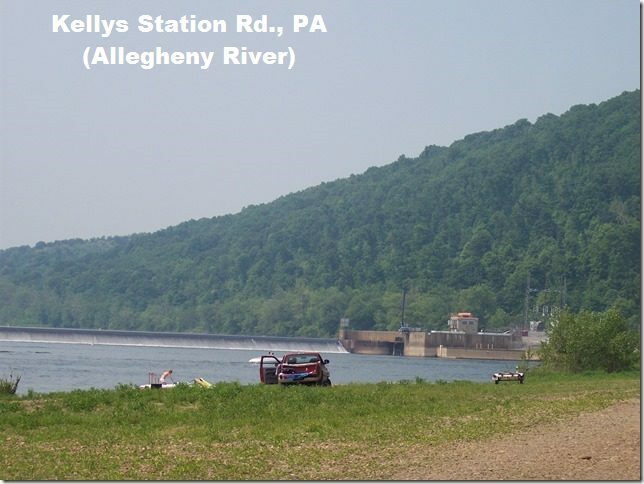 From Warren, PA cross the Allegheny River to the south side then take RT 59 (Kinzua Rd.) east past the Kinzua Dam to intersection of Allegheny N. F. RT 262 (Longhouse Drive). Turn right onto Longhouse Drive and proceed for 4 miles to the Elijah Run rec. Area and boat launch. Distance from Kinzua Dam is approximately 7 miles. Park at the Rec Area and follow the paved path until you reach a huge rock where the path ends. Water is deep enough to jump off the rock and offers beach swimming. No better directions. (Also beach swimming south of here at Kiasutha Rec. Area. 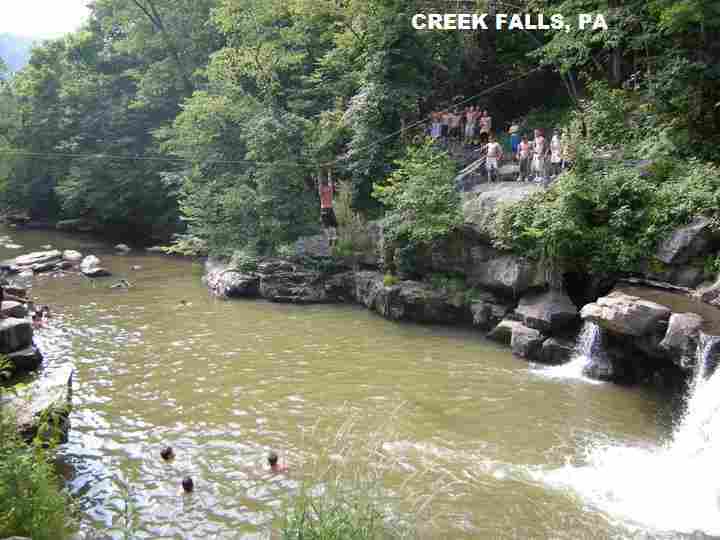 Several swimming holes in the scenic Wills Creek. For details, see DIRECTIONS below. Primitive camping at Goosebury (no facilities). Otherwise at Shawnee S.P. 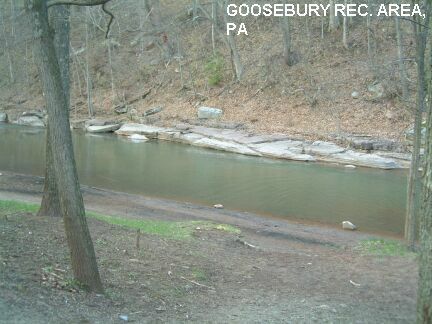 GOOSEBERRY RECREATION AREA [GOOS]: Swimming hole in Wills Creek, established place, dirt beach. A long-time user says: "Very nice country setting, great place to get away for a relaxing day at the ole' swimmin' hole. Nice family place." Camping is no longer permitted (2014). PHOTO. To get here from Hyndman, follow Fairhope Rd. about 2.5 miles. The recreation area and swimming hole are clearly visible on the left. LAT,LON lat=39.83214,lon= -78.74909(source: measured) (accuracy: exact) LINK TO GOOGLE MAP. Very confident. Verified 4/04. Updated 4/04. You have to walk across a railroad track and if you don't cross at the right place (see directions below) you could be trapped if a train comes by. The creek has a very steep gradient and is dangerous when there is lots of water in it. PHOTO 1 , PHOTO 2 , PHOTO 3 , PHOTO 4 , PHOTO 5. You MUST cross the railroad tracks at the right place. Crossing too early puts you on a narrow ledge high above the creek with no room to avoid a coming train which you might not see (because of a sharp curve) or might not hear (because of the waterfall)! Walk about 50 yards up stream PAST the first place where you might be tempted to cross the tracks. Go to the sign for the "Fiber Optic Cable Crossing". Here there is room to cross safely and a path that leads to the streamside. Look both ways and cross here CAREFULLY - DO NOT CROSS THE TRACKS IF YOU ARE NOT SURE YOU CAN DO SO SAFELY! After you cross, go straight into the woods and you will see a distinct path down to the creek, upstream of the falls/rapids. The swimming hole is here. Very confident. Verified 4/04. Updated 4/04. Swimming holes near Ford City. For details, see DIRECTIONS below. Crooked Creek COE campground east of here. 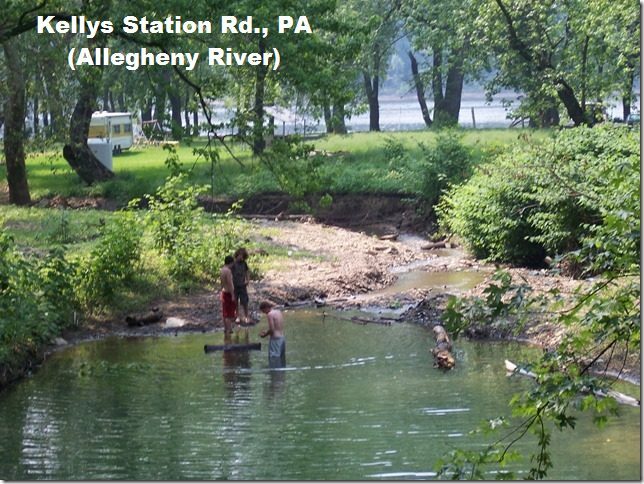 KELLY STATION ROAD [KELY]:Swimming and water play access point on the Allegheny River. BE VERY CAREFUL OF SWIFT CURRENTS IN LARGE RIVERS! ALSO THIS AREA FLOODS OFTEN. To get here from Ford City, stay on RT 66 and go about 8 miles south of Ford City then turn west (right) on RT 2030 and go about 1.5 miles (it becomes Kelly Station Rd) to the end of Kelly Station Rd at the Alegheny River. River access point is near here. PHOTO , PHOTO , PHOTO LAT,LON lat=40.70882 lon= -79.57438 (source: map) (accuracy: approximate) LINK TO GOOGLE MAP. Pretty confident. Not verified. Updated 11/2013. 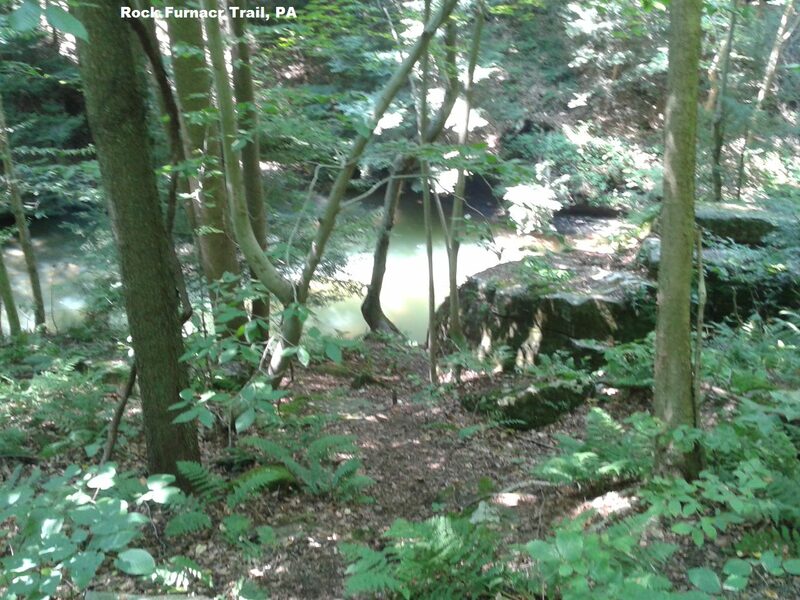 ROCK FURNACE TRAIL [ROCT]: An easy hike (mostly paved) in the Roaring Run Recreation Area to several swimming places and scenic waterfalls (Jackson Falls). Some info links: INFO ,INFO. Some photos: PHOTO , PHOTO , PHOTO. To get here, continue south on RT 66 to the town of Apollo. In Apollo, go east on 1st Street (RT 56) then turn south (right) onto Pennsylvania Avenue. This road turns to the left and becomes Old State Road. After about a mile, turn right onto Jackson Road (Route 2050). At the end of Jackson Road take a right onto Brownstone Road. Follow this for about .5 mile. The parking area for the trail head will be on the right. Four Quarters Farm is a private "Interfaith Sanctuary" campground, but anyone can join or be a guest of a member. There are several pristine swimming holes here in the creek. Four Quarters Farm also has several festivals each summer that are open to the public and registered campers are welcome to use the swimming holes. See their website FOUR QUARTERS FARM. Private campground - requires membership or festival registration fee. Camping at site, private, membership or festival registration required. See web site above. See directions on web site above. Informal kids water-play area (not really deep enough to swim) in pretty town park in Galesville. (For travelers: it is right next to library with internet access, too!) [See also nearby "Ole Bull S.P." 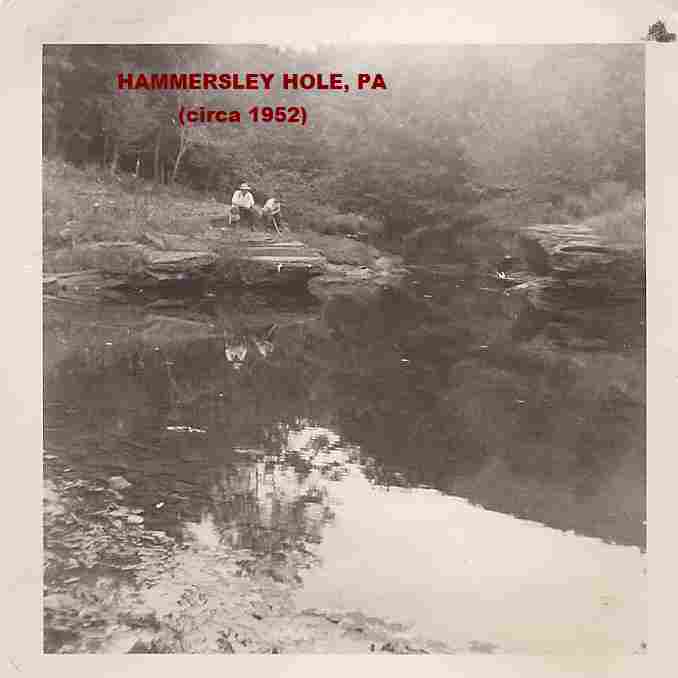 and "Hammersley Hole" swimming places]. East of here at Colton Point S.P. (at PA Grand Canyon) and west at Lyman Run S. P.. In Galeton on RT 6, turn south at West St on the west side of town then turn east (left) on Park Lane (next to the gas station). The park is here. We received this note in 6/2013: "This is open to the public to swim, raft, etc BUT there is no parking allowed, all cars will be towed. People need to be dropped off then picked back up to use this spot. There is no public parking anywhere near this area. There are tow signs posted but people don't pay attention to them." Tube and swim at various locations along Muddy Creek. Very pleasant, easy hike along creek. Tubing, swimming and water play along here, depending on water level. No need to walk all the way but the trail is about 3 miles along the entire creek. 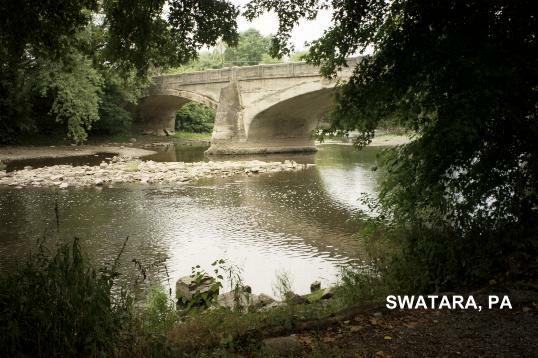 Water can be swift and rough at certain locations especially after a rain. People camp sometimes, however, not sure if this is allowed. 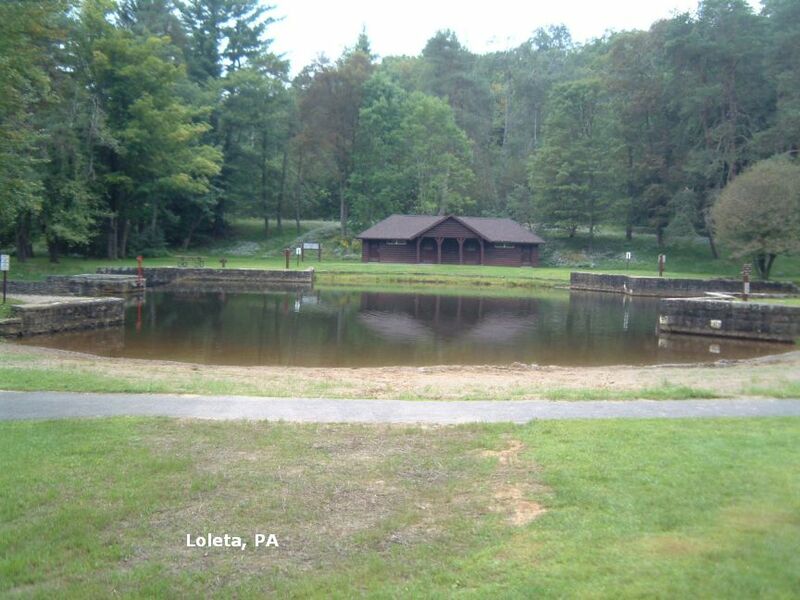 Nearby at Otter Creek Recreation Area (PA Power & Light), reservations available, call 717-862-3628. From York, take RT 74 southeast past RT 425 and past RT 372. Just before the town of Castle Fin, turn left onto Paper Mill Rd. In a short distance, this road crosses Muddy Creek. (There is no parking anywhere near the bridge - you need to be dropped off and picked up.) The trail is downstream on the right bank. Swimming/tubing places are along here. Small lake formed by dammed creek in very beautiful setting. Swimming area is in lake - not really a "swimming hole" but so beautiful that it is included here. Very nicely developed campground at site. From State College, take RT 26 south east though Penns Grove Mills to McAlevys Fort (past the turn off for Whipple Dam S. P. where there is also swimming but no camping) then continue straight on RT 305 to signs for Greenwood Furncae S. P..
A serious hike (12 miles total, some steep grades) to a small cascade and a deep hole in the Hammersley Fork creek, deep enough to swim even in mid-summer. [See also nearby "Ole Bull" swimming place.] A frequent visitor here warns that THERE ARE MANY RATTLESNAKES IN THIS IMMEDIATE AREA, BE CAREFUL! DO NOT PUT YOUR HANDS OR FEET ANYWHERE YOU CANNOT SEE FIRST, LIKE UNDER A ROCK OR LOG OR ON A LEDGE. SNAKE ALERT . Nearby at Ole Bull S.P. Unknown, probably optional, very remote. This from a hiker who went here:" There are actually two entrances to this road, but only the northerly one is open; the other one crosses a small bridge which is marked "closed." The dirt road proceeds north one-half mile through private land paralleling the Hammersley Fork Run, before entering State Forest land. The road fords the stream but is closed to vehicles; a two-cable foot bridge crosses the stream. You may also cross the stream by foot. Follow the road on the west side of the stream about one mile north. There is a private swinging bridge and another cable bridge to allow you to cross back over the east side of the creek. Follow the stream north until you cross the County Line run. Watch along the foot of the mountain for a very narrow footpath that goes up a grade and runs along the mountainside parallel to Hammersley Fork. This footpath levels off. You will descend once again to Dump Hollow. If you were not able to find the footpath, you can connect with it here. Continue to follow the path. You will come down to the Elkhorn Hollow. Follow the path once again. Finally, the path will descend to stream level. Follow the path a short distance and you will arrive at the Hammersley Pool. This hike is more than 12 miles long (round trip), and the terrain is very demanding. The mountainside trail is quite narrow and the slopes are very steep. Also, your warning about rattlesnakes is correct -- we saw one on our hike. A map is essential, because the footpaths are not easy to find and the Hammersley Fork branches off into many tributaries as you head upstream. This hike should only be attempted by a serious hiker with good map skills!" 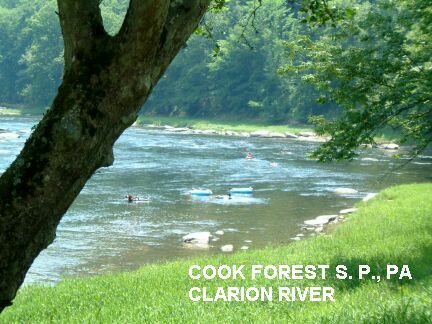 Swimming/wading places in and near Hickory Run S. P.. For details, see "DIRECTIONS" below. CAUTION: This area is infested with ticks and also has black bears that are NOT afraid of people - wear deet, do a tick-check and be careful! Hickory Run S.P. has camping. 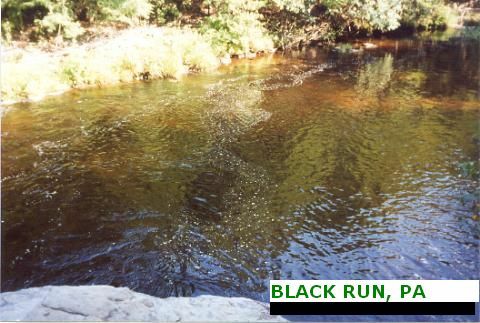 BLACK RUN [BLAR]: Large, deep, beautiful and very secluded swimming place (suits optional?) in Black Run below small waterfall. Rocks to sun on and jump from. In PA State Game Land #40 (Near Hickory Run S.P.). PHOTO 1 , PHOTO 2. LAT,LON lat=41.0436, lon= -75.743(source: measured) (accuracy: exact) LINK TO GOOGLE MAP. 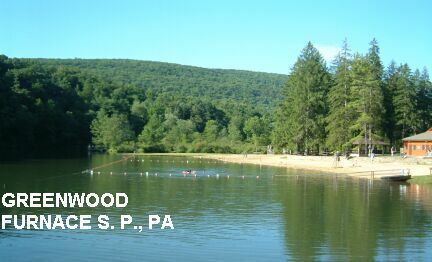 Note: Swimming is not permitted under PA State Game Lands regulations. Now follow these directions carefully: Right next to the sign is a wide grass trail (check for ticks after you return), as wide as a vehicle width, with a large, brown metal gate crossing the trail with a smaller sign "closed to all motorized vehicles" tacked on the gate. Start on this trail and about .25 mile, you will come to an intersection of several grass trails going in all directions. Turn right and walk about 50 feet to another grass trail intersection, turn (sharply) right again. This trail leads down a moderately steep trail and is rocky in some areas. At the bottom of this trail, it ends in a T intersection with grass trails going to the left and right. Take the right trail and follow it as it narrows and ends at a campfire pit (about .25 miles). 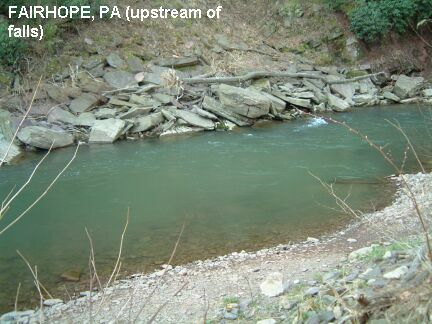 The swimming hole is shortly downstream from the creek that is on the left side of the campfire pit. There are two options to get to the hole, either walk on top of the large boulders that are in the creek or to go back to the campfire and go further into the woods, walking in parallel to the creek, ducking low tree branches along the way. Either way, you will end at the deep pool below the large rock. Caution: enter the water and scout the pool first before jumping because rocks at the bottom jut upwards. Very confident. Verified. Updated 8/2009. 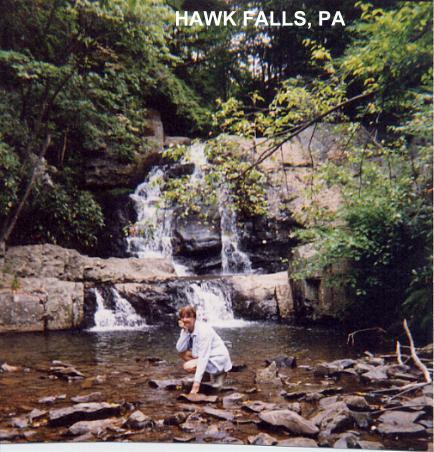 HAWK FALLS AREA [HAWK]: A beautiful waterfall with wading/showering. It is a very pretty site, an easy hike and a nice place for a picnic lunch. (But there are sometimes a LOT of folks here!) 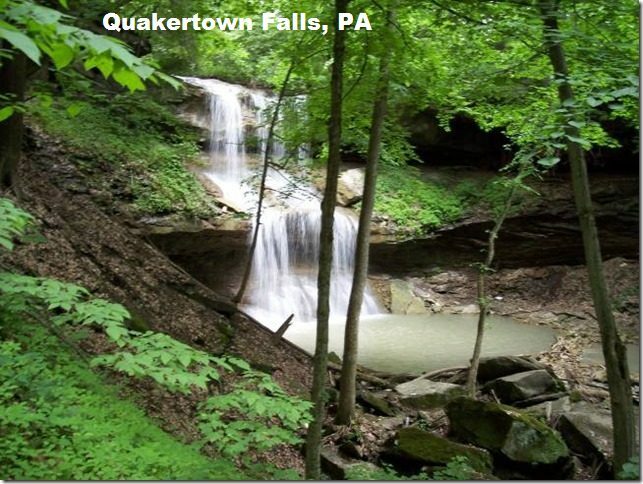 There is a large but shallow pool for wading and splashing below beautiful, two-drop waterfall on Hawk Run. Another place: along the same trail, before you get to Hawk Falls, is a water play place, quite deep, at the foot of some large rocks across the creek. LAT,LON lat=41.00639, lon= -75.63417 (source: Topozone ) (accuracy: exact for Hawk Falls) LINK TO GOOGLE MAP. To get here from RT 534, continue southeast into the State Park, continue on RT 534 past all the signs for swimming, camping, etc. until you pass under a major highway bridge (the PA Tpke) then park at the first parking area on the right. Either way: Don't take the trail that begins in the parking area but park and walk west on the road about 100 feet, staying on the left side of the road to a trail that begins at the "Hawk Falls Trail" sign. Caution: trail is moderately challenging so do wear a good pair of walking/trail shoes. After crossing the creek, about 200 feet further down the trail, there is a fork. You will hear the falls off to your right and if you take the right fork here you can go out on a rock ledge to see the falls BUT DO NOT TRY TO CLIMB DOWN THE ROCKS TO THE BOTTOM. If you keep going a bit more on this trail to the end of the trail, it will follow Mud Run then join Hawk Run and you will end up at the bottom of Hawk Falls- much safer and easier than climbing down the rocks from above. PHOTO 1 OF FALLS , PHOTO 2 OF FALLS. The other, deeper place is in Mud Run as the trail parallels Mud Run and before you get to the bottom of Hawk Falls. 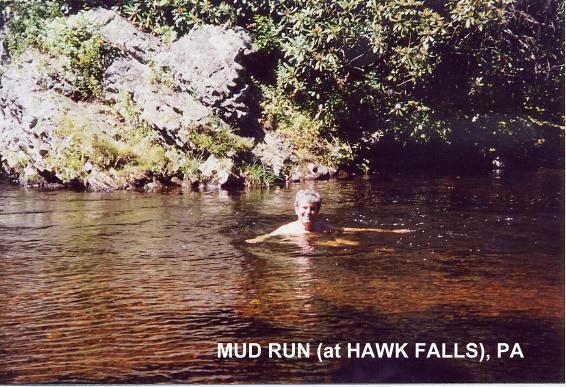 On the trail to the bottom of Hawk Falls, you will be walking alongside of Mud Run where you will see side trails to the creek for water play and a deep place off to your left at the foot of some large rocks across the creek. PHOTO OF MUD RUN. 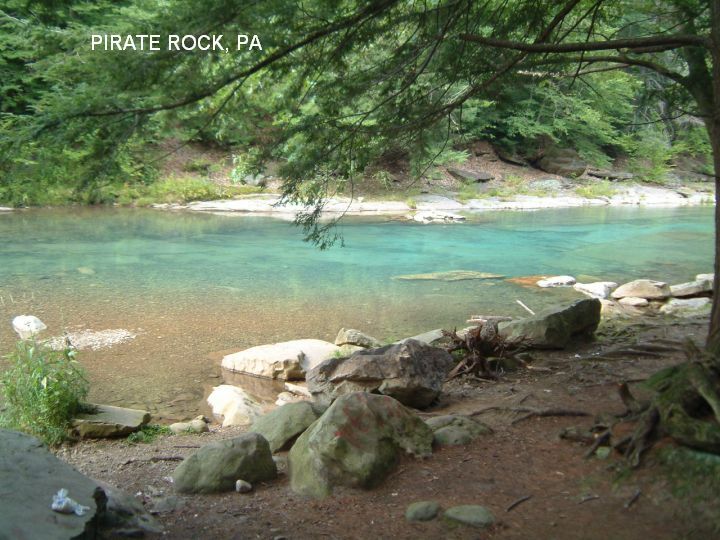 Swimming holes in river and lake near Jim Thorpe. 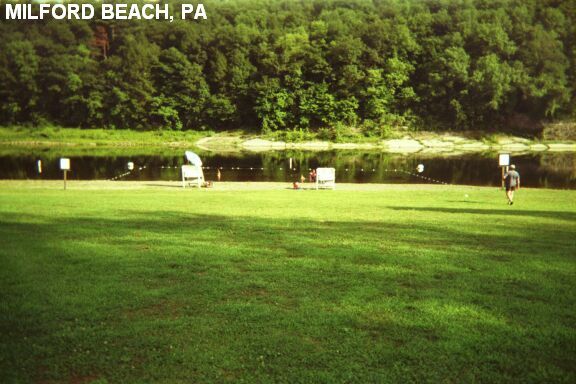 Camping at Mauch Chunk Lake Park, see below. Also camping nearby at Hickory Run S.P. 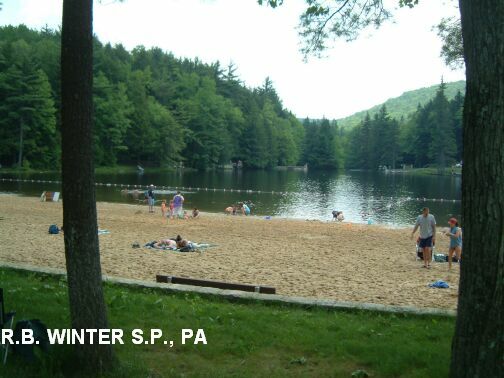 MAUCH CHUNK LAKE PARK [MAUC]: This from a visitor:"... we go to Mauch Chunk Lake Park in Jim Thorpe/Summit Hill, PA our girls love it, there is a roped swimming area you have to pay but if you go to the dam end there's some beautiful spots to go in, I've never had a problem with the rangers. Since we live in the coal region we are very careful about what water we go to because of mine run off, this is a good lake. " 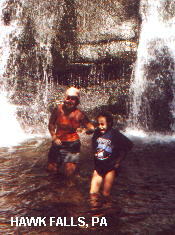 NOTE: We received this email in 4/2007:"To Whom It May Concern: I'm writing in regards to information contained on your web site about the swimming hole located near the cove at Mauch Chunk Lake Park, Jim Thorpe, PA. Please be advised that swimming in this area is not allowed. The cove is patrolled by Pennsylvania Fish & Boat Commission Water Conservation Officers and Carbon County Park Rangers any and all violators are subject to fines and or arrest. Swimming is authorized in designated areas only per Pa Fish & Boat regulations. Thank You, Gerard Healy, Chief Ranger, Carbon County Parks Department"
PARK WEB SITE. LAT,LON lat=40.84325, lon= -75.79886(source: DeLorme) (accuracy: approximate) LINK TO GOOGLE MAP. To get here, at the first traffic light as you come into Jim Thorpe on RT 209, make a left (on West Broadway or Race St ?) and go approximately 4 miles from this stoplight. The entrance to Park is on left. MORE DETAILED DIRECTIONS. Pretty confident. Not verified. Updated 1/18/2007. 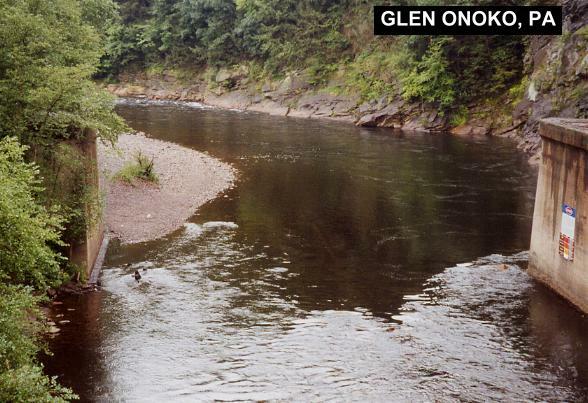 GLEN ONOKO [GLEN]: Trestle over Lehigh River makes a favorite swimming hole for students from Jim Thorpe in the Lehigh Gorge S.P.. 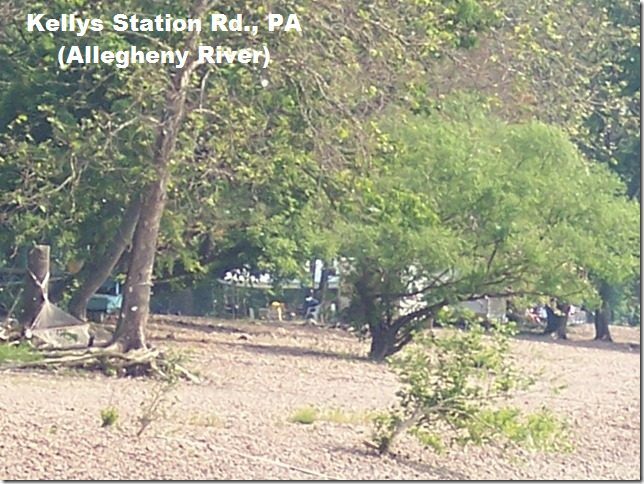 There is a swimming place below trestles here in the Lehigh River. PHOTO 1 , PHOTO 2. People have been known to swing from a rope that is sometimes under a trestle or to jump from a trestle. This is both dangerous (underwater objects-a sunken train, for one- are hidden in the water below) and illegal. 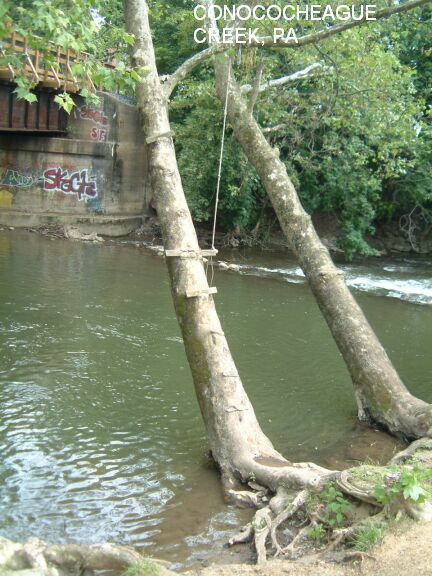 I received the following in an email from a state official in 7/2003: "The rope swing under the vehicular bridge is definitely illegal. The Park cuts that rope off as often as we can and has cited people in the past for using it. The train bridge is private property, patrolled by the railroad police. The local patrolman is particularly aggressive towards anyone even walking on that bridge. This is due in part to some serious injuries that have occurred here. Two in particular come to mind. A man caught an iron bar under his armpit and ripped his arm open to the elbow. In another, a teenager struck a submerged railroad tie that was floating down the river. From: David Fry, Ranger for Hickory Run and Lehigh Gorge State Parks." There is also the famous Glen Onoko Falls near here, but it is not known if there is actually a place to swim at the falls, I did not find one on a visit there 8/00. LAT,LON lat=40.883,lon= -75.762(source: Topozone ) (accuracy:exact) LINK TO GOOGLE MAP. To get here from RT 209 approaching Jim Thorpe from the south, (see above), follow this route to Jim Thorpe to the intersection of RT 209 and RT 903. Turn north east (right) at intersection onto RT 903, which crosses Lehigh River and turns to the left. Follow this route about .25 mile -- until it turns sharply to the right. At this point, there is a stop sign, intended for those traveling straight, instead of turning right. Go straight onto this road. (One more roadmark that you will notice is when you approach the "hard-right" intersection is a brown sign with "Glen Onoko Falls (arrow pointing straight)" on the right, prior to the intersection.) Continue down this road, which turns into a steep road with several moderate curves until you see another road on the left, marked with the "Lehigh Gorge State Park" sign. Turn left and follow this road until it ends at the parking area -- there are two parking areas: one before the railroad trestle and the other immediately after you cross the railroad trestle. Both lots are adjacent to the swimming hole. Access to this hole requires virtually no hiking at all. KEEP OFF THE TRESTLE! Very confident. Verified 8/2000. Updated 1/18/2007. Attractive, isolated National Forest campground along Tionesta Creek. The creek is quite shallow here, more for water-play and tubing than swimming, but there appeared to be a deeper area just north of the bridge to the campground where some swimming might be possible. 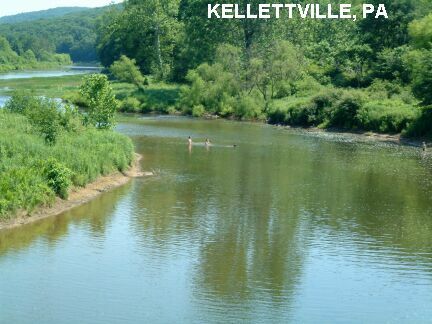 At site - Kellettville Campground, Allegheny N. F.
From Tionesta (in northwest PA, at the southwest tip of the Allegheny National Forest), go north 7 miles on RT 62, then east 11 miles on RT 666 to Kellettville campground. We received this notice in 7/2009:"Much of this area was purchased by Countryside Conservancy in 2004. Since that date we have opened the property to the public, but we DO NOT PERMIT SWIMMING on Conservancy property. There is therefore no "sanction" to use this site for these activities. Signs on the property clearly state our regulations. This is a beautiful spot and we encourage visitors to use it for hiking, fishing, picnicking and other activities, but in order to protect visitor safety, we cannot permit swimming,. 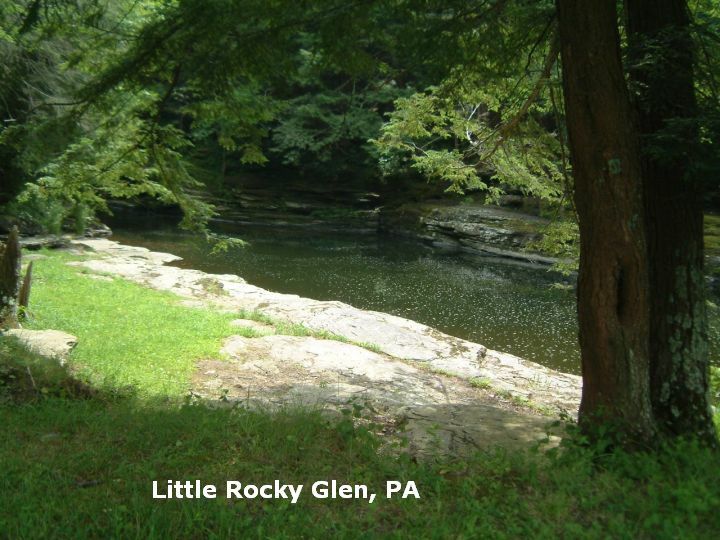 Mary Felley, Executive Director"
Traditional swimming holes in creek within beautiful glen area. Lackawanna S.P. is nearby, has camping. From Scranton, north on RT 9 about 15 mi to RT 6/11. Go northwest on RT 6/11 through Factoryville. Continue on RT 6 about 2 mi past where RT 11 turns off (do not take RT 11 here) and go left (South) on Lithia Valley Rd.. Go about .4 mi to bridge, cross bridge and park along road. Walk back across bridge to gate with Countryside Conservancy sign. Go around gate and walk trail above the creek and glen for less than 10 minutes to picnic area. 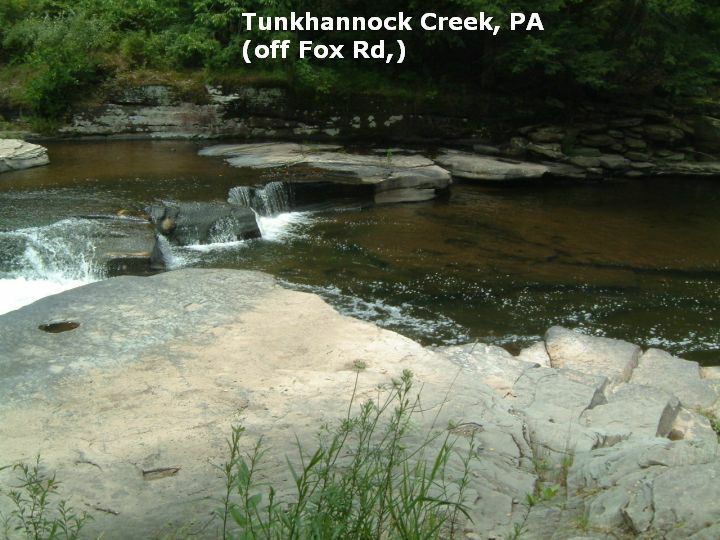 There is also another apparent swimming place in the South Branch Tunkhannock Creek just west of here. The next road west of Lithia Valley Rd. off RT 6 is called Spur Rd. and going south from it turn onto Fox Rd.. Very shortly after you turn there is a small turn out on the left and a large deep spot under a low falls on the right: Photo . 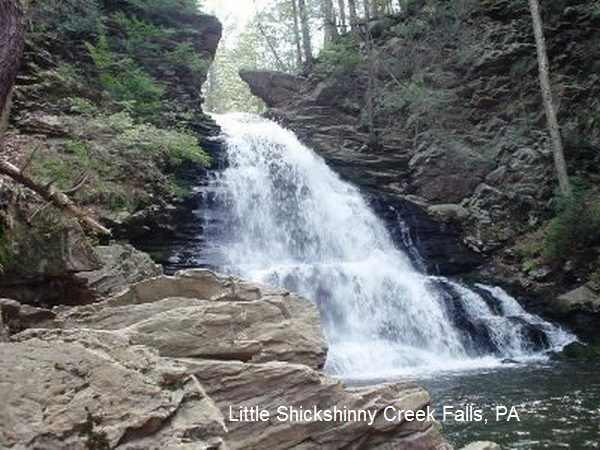 A one mile round trip walk to where Little Shickshinny Creek drops over a 30 foot falls before joining the Susquehanna River at Shickshinny. Deep pool at the bottom has a rope swing. WEB SITE INFO . From Wilkes Barre, take RT 11 about 15 miles southwest to Shickshinny then turn west (right) on Grand St. (set odometer) and continue onto Shickshinny Valley Rd.. When you have gone 1 mile from RT 11, look for the parking area for State Game Land 260. Park and walk a bit further on the road and find a very apparent trail on the right side of the road (may be a sign here for "Little Shickshinny Creek Road") and walk about .5 mile down this old logging road to the creek and falls. 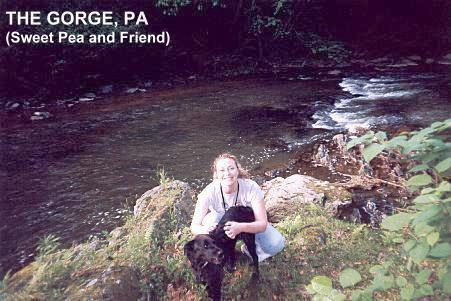 Long-time family water play and swimming place in one of the cleanest, most cared for creeks in western PA.. There are several swimming holes in this creek in this general area. THERE IS ALSO LOTS OF PRIVATE PROPERTY ALONG THE CREEK AND YOU ARE RESPONSIBLE FOR FINDING ACCESS THAT IS NOT PRIVATE. We do not have a specific access point that is public. DO NOT LEAVE TRASH ALONG THIS CREEK. From Pittsburgh, take I 279 north then Exit 8 for Camp Horne Rd.. Turn left onto Mt Nebo Rd and continue onto Blackburn Rd.. Turn left onto Blackburn Rd and go right to stay on Blackburn Rd.. Turn right on Fern Hollow Rd. and turn left on Little Sewickley Creek Rd.. THERE IS LOTS OF PRIVATE PROPERTY ALONG THE CREEK AND YOU ARE RESPONSIBLE FOR FINDING ACCESS THAT IS NOT PRIVATE. Small swimming area between 2 dams in creek, unique spring-fed pool, nice beach. Bathrooms and changing rooms. 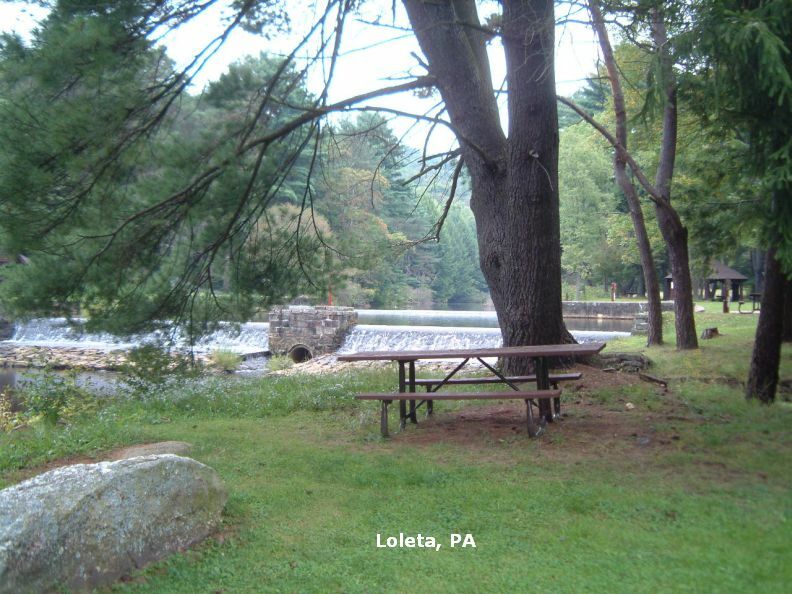 At site; Loleta Campground, Allegheny N.F. From Marienville, RT 2005 south (Loleta Rd.) about 5 mi to campground. The swimming place is at the Upper Camping Loop - go past the first camping area then turn left (unsigned) into the second camping area. 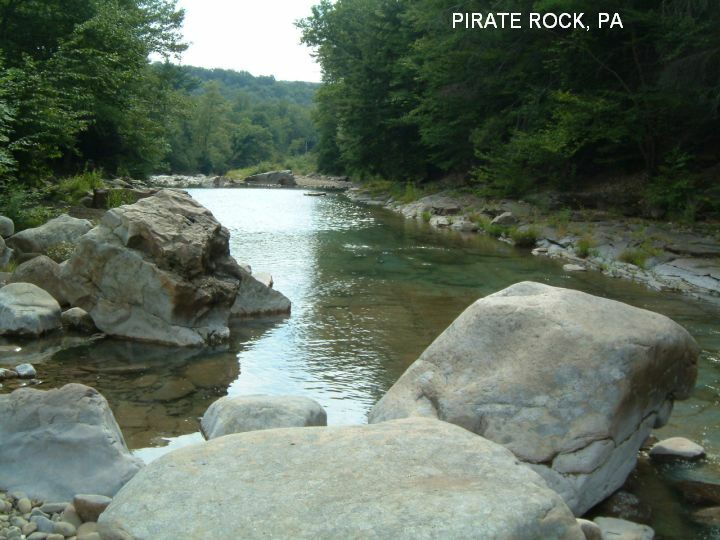 Many places to swim in the beautiful Loyalsock Creek gorge, generally northeast of Williamsport. See DIRECTIONS below for details. 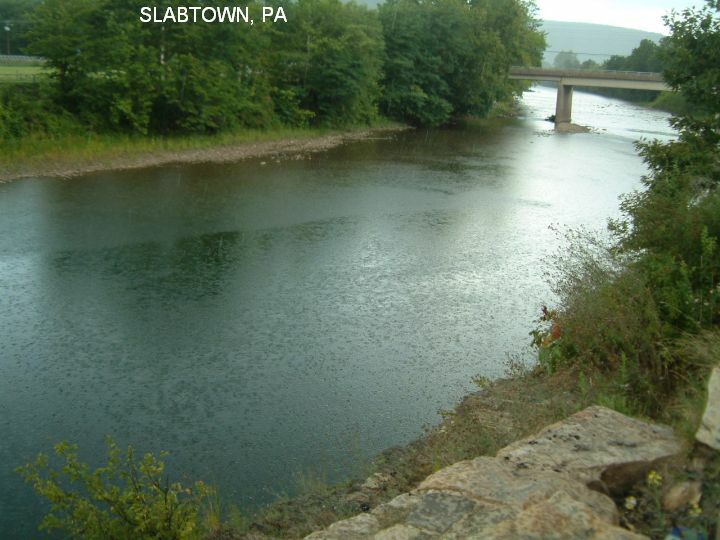 SLABTOWN [SLAB] Swimming hole and jumping place in Loyalsock Creek. PHOTO , YOUTUBE , YOUTUBE . To get here, continue north on RT 87 to the town of Loyalsock. Just south of the intersection with RT 973, park in a gravel pull-off on the east (right) side of the road. Cross the road (VERY CAREFULLY! ), climb over the guard rail, go down a small path, and you will find yourself on a 15-20 foot cliff directly over Loyalsock creek. You can climb down the embankment to swim, or, most people jump off the cliff with a running start. CAUTION - Do not attempt to jump here unless you are sure the water depth is adequate and you have someone experienced with this place to guide you - you must jump OUT to clear the rocks below which may be hidden by the water! LAT,LON lat=41.32395,lon= -76.91104(source: measured) (accuracy: exact) LINK TO GOOGLE MAP. Very confident. Verified 8/08. Updated 8/2008. 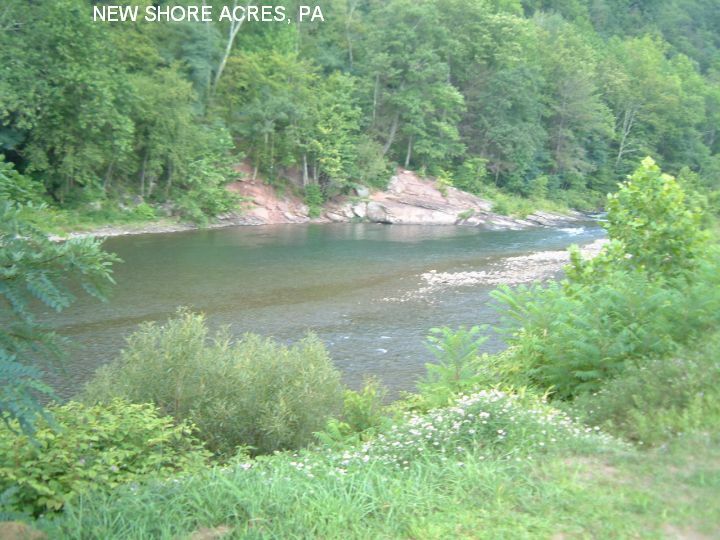 NEW SHORE ACRES [NEWS]Swimming hole in Loyalsock Creek. PHOTO , YOUTUBE (not sure this is the right place). To get here, continue north on RT 87 from Slabtown a short way to the New Shore Acres Restaurant - about 5 miles north of Montoursville on the west (left) side. Park away from the building - it is a big lot. Walk down to the creek, wade across the creek, and walk up stream to a very nice small hole about 11 feet deep. LAT,LON lat=41.34037,lon= -76.92095(source: measured) (accuracy: approximate) LINK TO GOOGLE MAP. Very confident. Verified 8/08. Updated 8/2008. THE BEND [BEND] Another good swimming hole in Loyalsock Creek, across from the Fairgrounds and popular with locals. To get here, continue north on RT 87 and turn east (right) on RT 154. Go through Forksville. The swimming place is on RT 154 across from the Sullivan County Fairgrounds, halfway between Forksville and World's End S. P.. It is at the far end of the fairgrounds (south end). There are areas of "no parking", please obey these. LAT,LON lat=41.4765,lon= -76.5884(source: DeLorme) (accuracy: approximate) LINK TO GOOGLE MAP. Very confident. Verified 8/08. Updated 8/2008 . 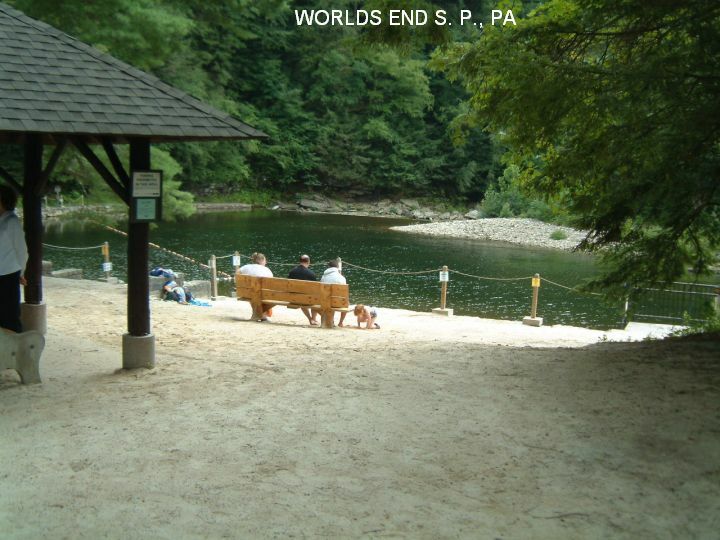 WORLDS END S. P. [WORL]Official Loyalsock creek swimming, with beach - a very fine family place. All facilities, including changing rooms and concession stand. PHOTO 1 , PHOTO 2 . Very nicely developed camping at site. No fee to swim. Phone: (717)924-3287. LAT,LON lat=41.47043,lon= -76.58365(source: measured) (accuracy: approximate) LINK TO GOOGLE MAP. To get here continue east on RT 154 a short way and follow signs to World's End S.P. Very confident. Verified 8/08. Updated 8/2008 . 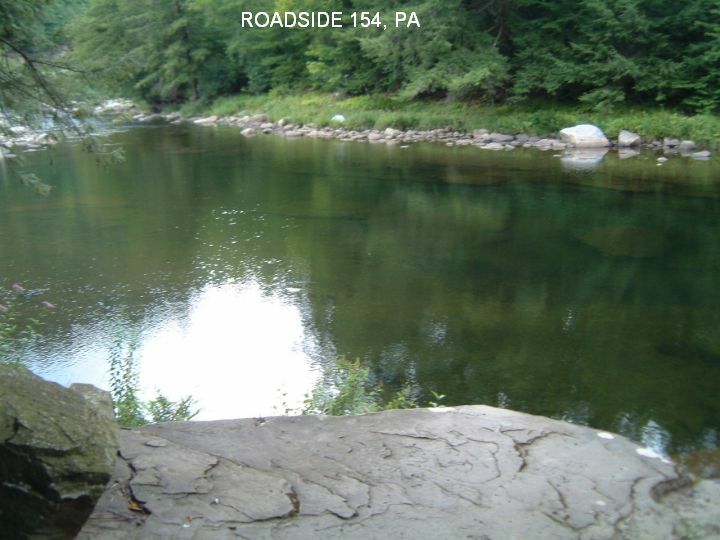 ROADSIDE 154 [ROAD] Another well-used informal swimming place in Loyalsock Creek. PHOTO . After you pass Worlds End on RT 154, look on the east (left) side of the road for a pull out with a sign "Area Closed to Camping". LAT,LON lat=41.45335,lon= -76.52856(source: measured) (accuracy: exact) LINK TO GOOGLE MAP. Very confident. Verified 8/08. Updated 8/2008 . 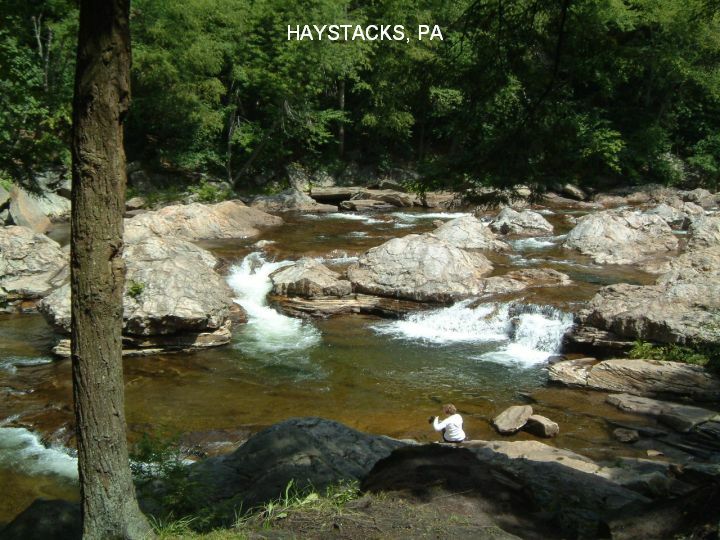 HAYSTACKS [HAYS]: From a fan:� There is a place known locally as the "Haystacks" on the Loyalsock creek in Sullivan county Pennsylvania. It requires a walk of well over a mile each way, but is well worth the hike. It is a sandstone rock formation that has been worn down by the creek to resemble a series of haystacks; hence the name. During regular water flow, it becomes a fantastic series of whirlpool-like holes that offer background scenery that is unmatched. The tub like pockets offer natural hot and cold running aerated jets in which you can sit and enjoy the surrounding mountain beauty. PHOTO 1 , PHOTO 2 , PHOTO 3 , PHOTO 4 . (Although to be honest, the hot doesn't actually work....)" LAT,LON lat=41.45717, lon= -76.48104(source: measured) (accuracy: exact) LINK TO GOOGLE MAP. Very confident. Verified 8/08. Updated 8/2008 . To get here: Continue east on RT 154 then turn north (left) at Laporte onto RT 220. From Laporte, after about 2 miles on RT 220, you will see a sign for the Loyalsock Trail's trailhead - turn left onto Meade Road to parking area. (The trail represents the terminus of the Loyalsock Trail (LT). See trail information below.). In the parking area, read the sign and you will see that the shortest way is to follow the "Haystacks Trail" but you could also follow the Loyalsock Trail (LT). The Haystacks Trail will take you over a trail for about 15 minutes then down to a former RR grade which you will follow about 20 minutes than go right down the "access Rd" for another 15 minutes to the creek. 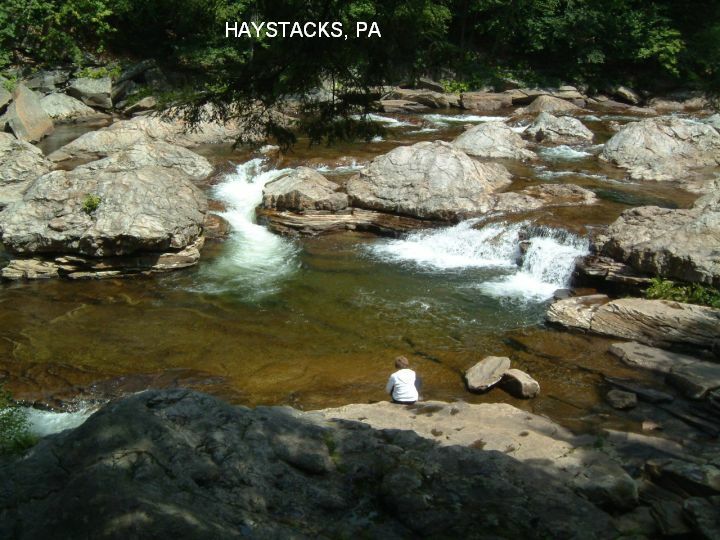 You will soon reach the Haystacks, a boulder reef over which the Loyalsock swirls and tumbles, there are 2 plunge pools and a whirlpool. This is a Class IV-V rapid during periods of high water. A great place to swim and scramble on the boulders. 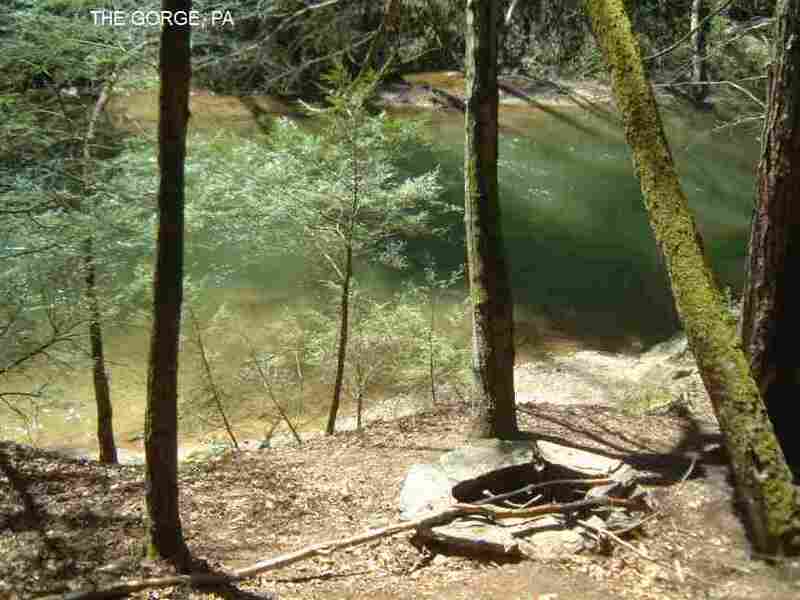 Also offers one of the most scenic primitive camping areas in the Mid-Atlantic. LOYALSOCK TRAIL [LOYT] All of the above swimming places are accessed by road. The Loyalsock Trail will take the hiker to many more remote places. 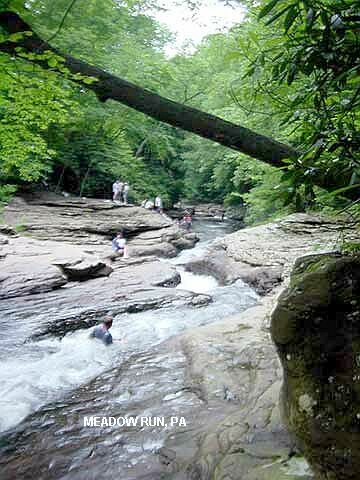 Get the trail map and hike segments or the whole trail and discover your own swimming holes. WIKIPEDIA INFO . This from a contributor:" The Loyalsock (LT) trail is so natural, rugged and scenic that even photographs cannot do it justice. It simply must be experienced to appreciate it. So, if you are in good shape, like rugged, challenging hikes, waterfalls, roaring mountain streams, dense remote woods and wildlife at its finest, get your hiking boots.........."
"The Loyalsock wilderness trail runs 59.3 miles through Worlds End State Park on PA154, Lycoming and Sullivan counties in north central PA. between LaPorte on US220 and Loyalsock on PA87. 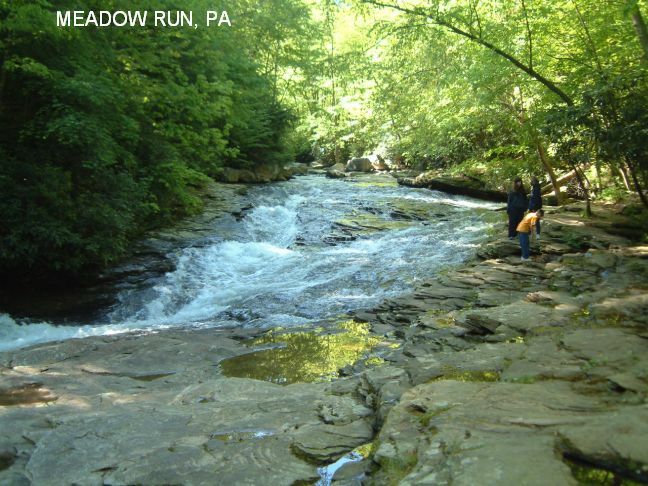 It features dozens of waterfalls ranging up to 75 feet high, many high vistas overlooking the rugged Loyalsock valley, spectacular stream courses, gorges and canyons as it winds through the historic coal mining, timber regions and rail beds of yesteryear. Breathtaking 400 foot high cliffs, hundreds of different rock formations, ledges, crevasses and caves. Hiking effort ranges from easy, flat woods walking to quarter mile sections that climb a rugged rock strewn 1200 feet in elevation. Hardwood forest, thickets of mountain laurel, rhododendron, blueberries and azalea compliment the countless species of wild flowers such as violets, trillium, gaywings and hepatica that spring up from the forest floor. A hiker may encounter tiny chickadees, woodpeckers and songbirds, wild turkeys, porcupines, skunks, raccoons, deer - all in their natural habitat." "Camping is available in the park and at designated wilderness sites, subject to regulation. The LT follows the cliffs above and drops down through Worlds End State Park where short trail sections may be explored and two spectacular vistas are accessible by auto. (Details and map at park.) The LT has sufficient road access to permit 4 to 10 mile long day hike segments." "Detailed LT trail maps and guides are available for $3.50 from the Alpine Club at P.O. Box 501 Williamsport, PA 17703. Their members do a fantastic job of trail marking and maintenance. Many thanks to them. 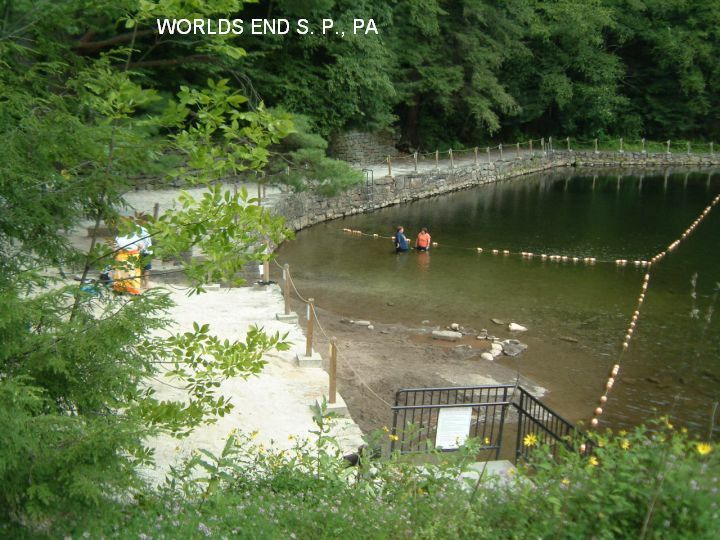 Also: Worlds End State Park P.O. 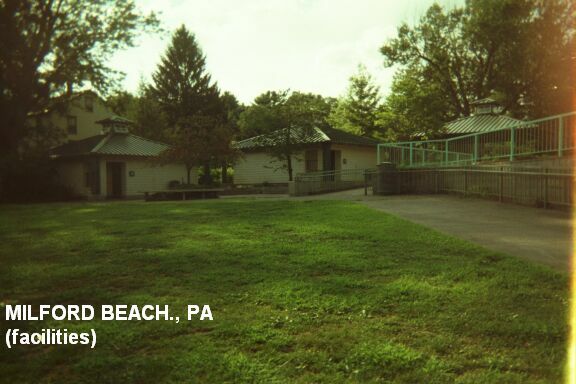 Box 62 Forksville, PA 18616-0062 Phone (717) 924-3287 (Kudos for the beautiful park area) or the PA Department of Parks at P.O. Box 8551 Harrisburg, PA, 17105-8551." 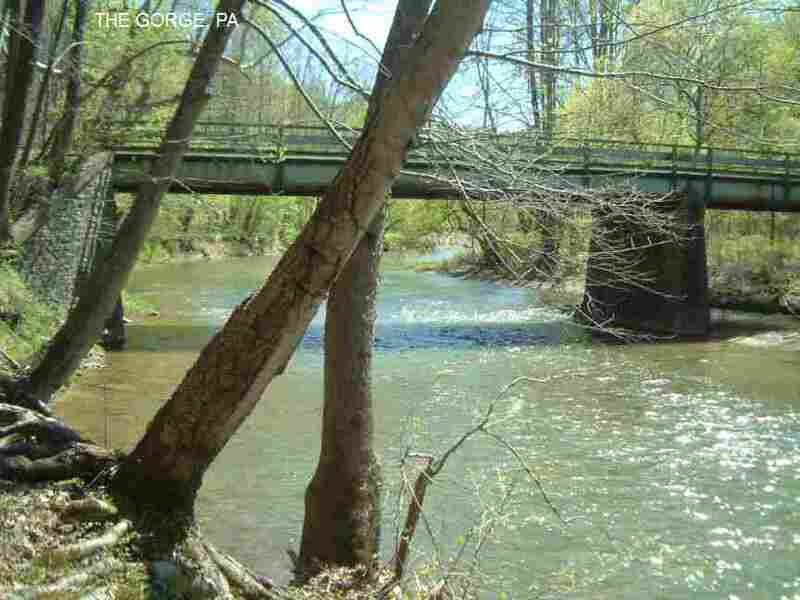 Place in Conococheague Creek under a historic and beautiful covered bridge. NOTE: The official policy here appears to be NO SWIMMING due to insurance provisions. There is a park sign here by the bridge so there must be a park but it is not clear what is park land and what is private land. Please respect private property when you go here. There is a park sign here by the bridge so there must be a park but it is not clear what is park land and what is private land. From Hagerstown, MD go north on I-81 to Greencastle, PA. Go west through town on RT 16. In about 1 mile from town, go left on Grant Shook Road. Follow it to Weaver Road then go right to a sign for Martin's Mill Bridge over the Conococheague. Place to swim and tube. 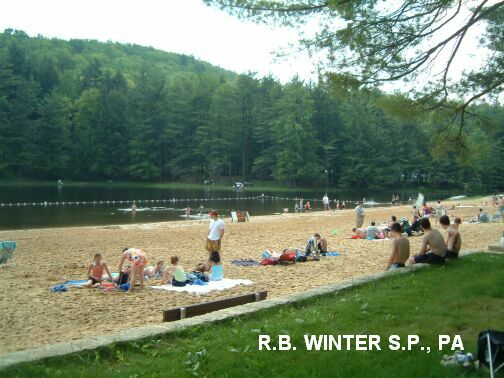 Swimming places in the Delaware Water Gap National Recreation Area. For details, see DIRECTIONS below. On New Jersey side there are several State Parks with camping. None nearby on PA side. 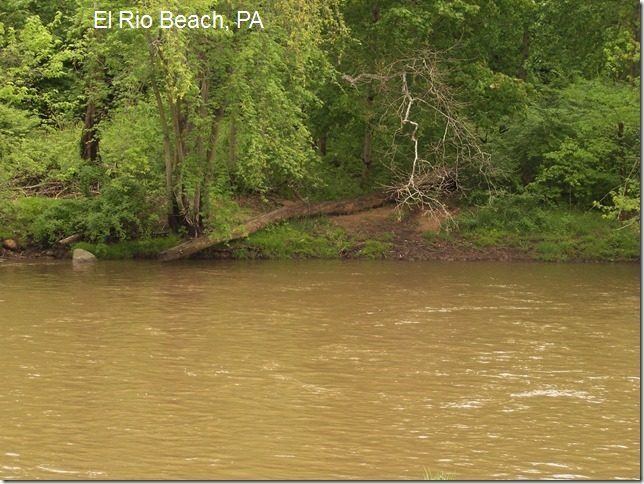 MILFORD BEACH [MILB] Very nicely-developed, small official swimming area on the Delaware River in the Delaware Water Gap National Recreation Area WEB SITE. with lifeguards, changing rooms, etc.. Good for the whole family! NRA entrance fee. PHOTO , PHOTO . Bathing suits required. LAT,LON lat=41.30889,lon= -74.79800(source: DeLorme) (accuracy: approximate) LINK TO GOOGLE MAP. To get here from the intersection of RT 6 and 7th street (above), continue on RT 6 straight through the intersection of RT 209 and RT 6 in downtown Milford (at the traffic light). Now you are on RT 209. Continue on RT 209 a short distance then turn east (left) on RT 2013 (Milford Beach Rd.) to the signs for the Milford Beach area. Very confident. Verified 8/05. Updated 8/05. HACKERS FALLS [HACK] Beautiful, cascade-type falls with huge, deep swimming hole at the bottom. PHOTO , PHOTO . 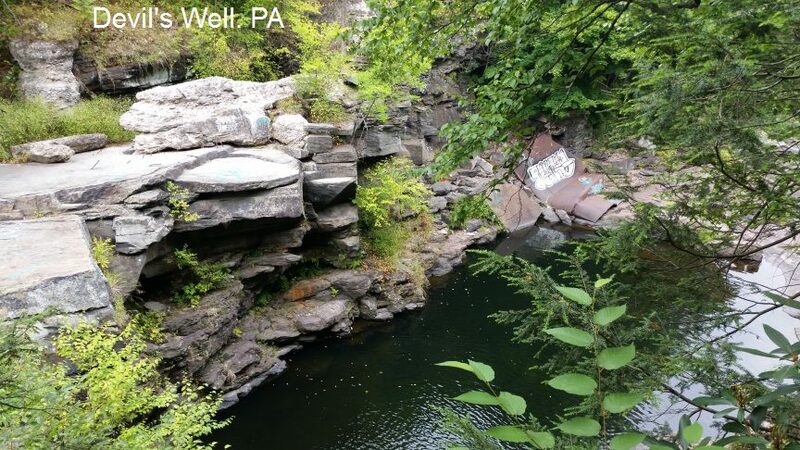 This is in the Delaware Water Gap National Recreation Area and swimming does not appear to be prohibited here. Climbing on and jumping/diving form the cliffs are strictly prohibited; citations will be issued. Alcohol and glass containers are also prohibited. This is a carrion/carry out site, so please take your trash with you. This site also ranks pretty high for serious injuries and rescues. Please be careful. About 1 mile (easy) hike each way. Gradual entrance slope, good for the whole family (but it does get deep!) No entrance fee. Bathing suits customary. LAT,LON lat=41.30053,lon= -74.83861(source: DeLorme) (accuracy: approximate) LINK TO GOOGLE MAP. From I84 take Exit 46 which is RT6. If you are going West on 84 make a left at the exit, If you are going East make a Right. From RT 6 as you enter Milford, go right (southwest) on 7th street (set odometer here) then right again on a road that may be signed: RT 2001 or Milford Rd. or Mill St. or Water Street. You will be on RT 2001 and soon driving along the western boundary of the NRA. At about 2 miles, turn at the Cliff Park Inn sign on the left (east) side(there is also a sign at one mile, DO NOT TURN THERE) and follow this road until you see the symbol for the hiking trails then follow the dirt road to the parking area (Cliff Park Trailhead) where there is a map and a vault toilet (LAT,LON of parking place: lat=41.3039,lon= -74.8329(source: measured) (accuracy: exact) LINK TO GOOGLE MAP.) (Make sure you turn left on the second sign to the Cliff Park Inn. The Inn and Golf Course are closed as well as the connecting road.) Hike on the red blazed trail for about .85 miles, then go left at the fork on the yellow blazed trail and you hear the falls after a minute or two and will see the Hackers Falls and the large pool below after about a 1/10th of a mile. Very confident. Verified 8/05. Updated 8/2013. ADAMS CREEK FALLS [ADAM] Swimming and wading are strictly prohibited at Adams Creek. Please do not visit here. 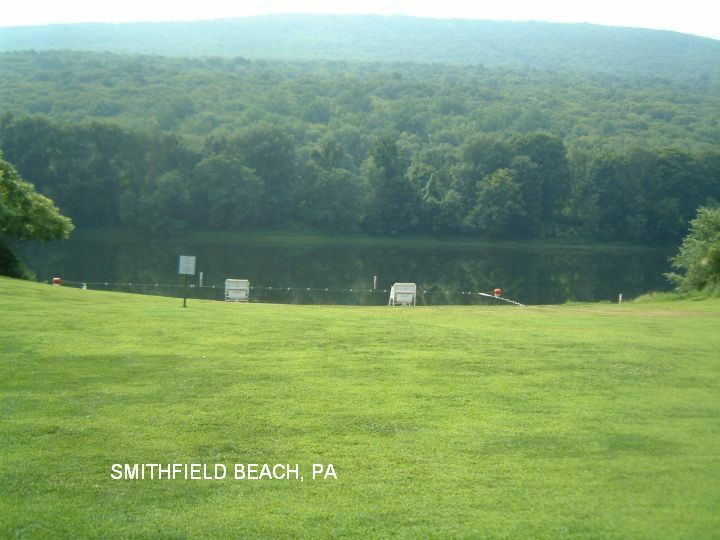 Commercially-operated lake with sandy beach, grass beach, picnic area, rentals, other facilities. A swing for jumping into the lake, a 15 foot high dive, a 3 foot low dive, many docks just to hang out, changing rooms and bathrooms, great fireworks on July 4th, food stand, canoe rentals-2 bucks an hour. Link to web site. Yes, see web site above. From Harrisburg, take I-76 (PA Tpke)east to Exit 20 (Lancaster/Lebanon). Turn left onto RT 72 (north). Proceed 2 miles to Mt. Gretna/RT 117 exit. Descend ramp to stop sign and turn left onto RT 117 (north). Proceed 2.4 miles to Mt. Gretna Country Deli ("Lake" sign on side of building), follow Lake signs, turn right onto Timber Road, bear left onto Lakeview Drive, bear 1st left into parking lot at Mt. Gretna Lake & Beach. Parking is free. 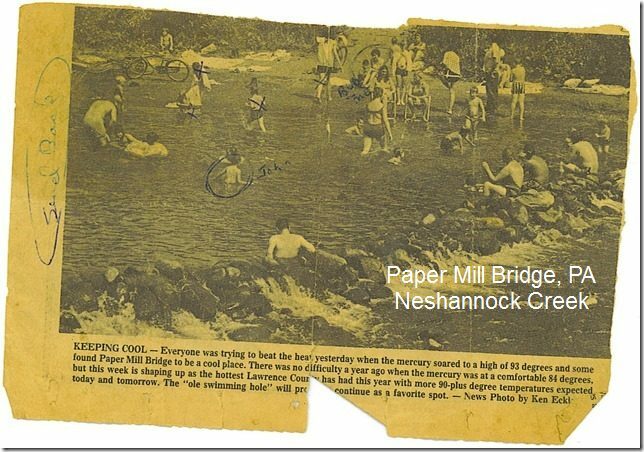 Several long-time local swimming holes in Neshannock Creek. For details, see DIRECTIONS below. Shenango COE Campground north of New Castle. 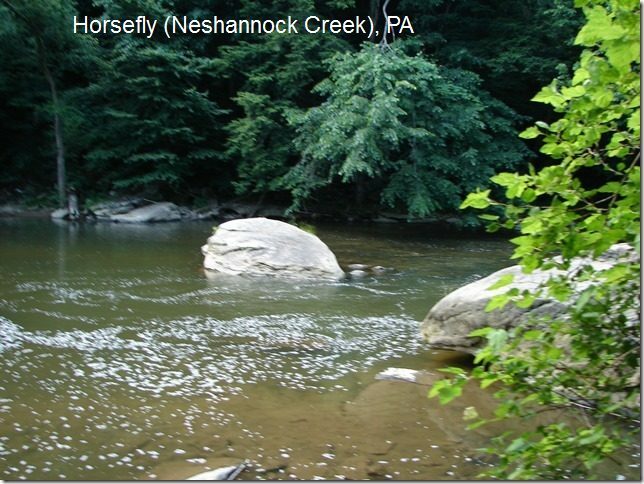 HORSEFLY [HORS]: This from a fan: "This is actually the deepest swimming spot on Neshannock Creek. It is probably chest High on a 6 ft guy. They used to refer to this spot as Bare Naked Beach because of all the skinny dippers." To get here from the intersection of Paper Mill Rd. and Dillworth Ave. (above), turn right on Dillworth and continue onto Smith St. and park. You actually go past Smith St. along the creek, past the old sealed caves on the right, and following the old railroad path. It�s a couple hundred yards on the left. Look for the big rocks. PHOTO. LAT,LON lat=41.01562, lon= -80.32195(source: map) (accuracy: approximate) LINK TO GOOGLE MAP. Pretty confident. Not verified. Updated 11/2013. 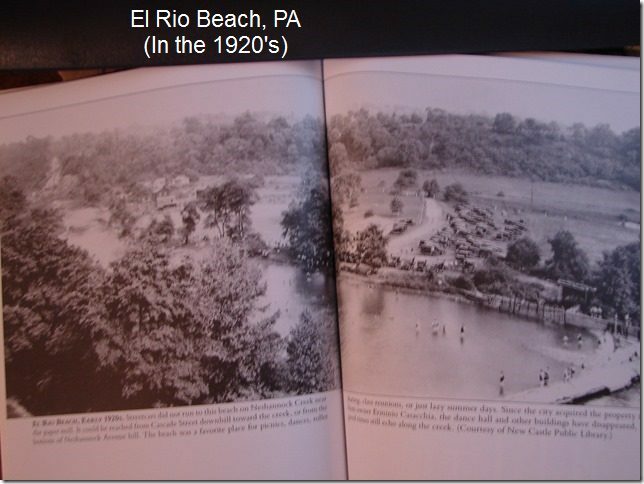 EL RIO BEACH [ELRI]: This from a fan: "You can drive down to it on the railroad path as long as your muffler doesn�t hang too low. The road can get muddy and some holes. This used to be a popular picnic spot. It's on Smith St.. Easy access. There used to be a skating rink years ago there. Its fenced in but the gate is broken and open. You are allowed there. There also is a big baseball field that they mow sometimes. There used to be restrooms, shelters, bocce. It's about 4 feet deep give or take." To get here from the intersection of Paper Mill Rd. and Dillworth Ave. (above), turn right on Dillworth and continue onto Smith St. and park. Walk down the railroad path toward the creek. It is a cleared area between the railroad path and the creek. PHOTO ,PHOTO. LAT,LON lat=41.01592 lon= -80.3237(source: map) (accuracy: approximate) LINK TO GOOGLE MAP. Pretty confident. Not verified. Updated 11/2013. 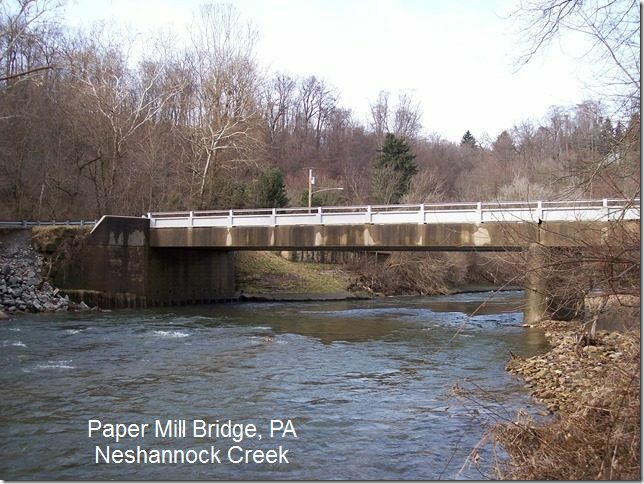 PAPER MILL BRIDGE [PAPE]: Long-time swimming place by a bridge . To get here from the intersection of Paper Mill Rd. 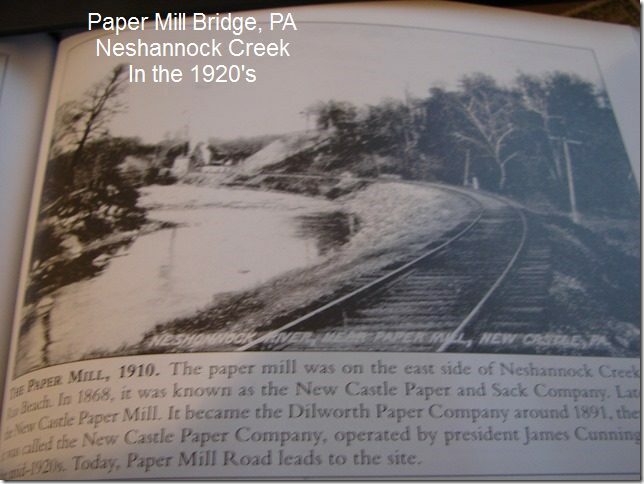 and Dillworth Ave. (above), turn LEFT on Dillworth and go a short way until the road crosses the creek (locals apparently call this the Paper Mill Bridge even though it does not appear to be on Paper Mill Rd.). The swimming hole is here by the bridge. PHOTO ,PHOTO , PHOTO ,PHOTO. LAT,LON lat=41.01310, lon= -80.33049(source: map) (accuracy: approximate) LINK TO GOOGLE MAP. Pretty confident. Not verified. Updated 11/2013. 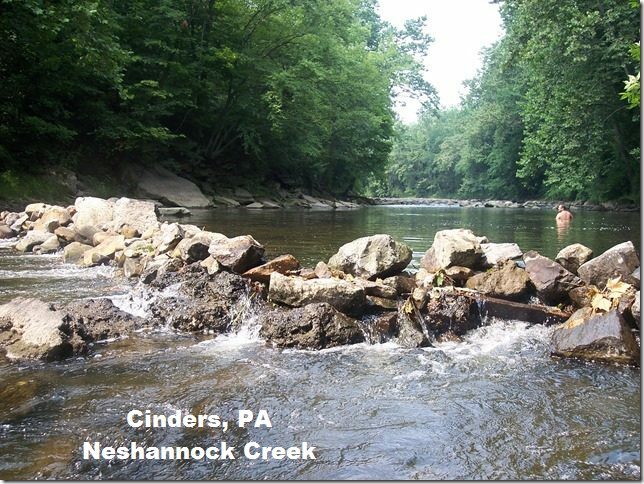 CINDERS [CIND]: A long-time local swimming hole with a low jumping rock. 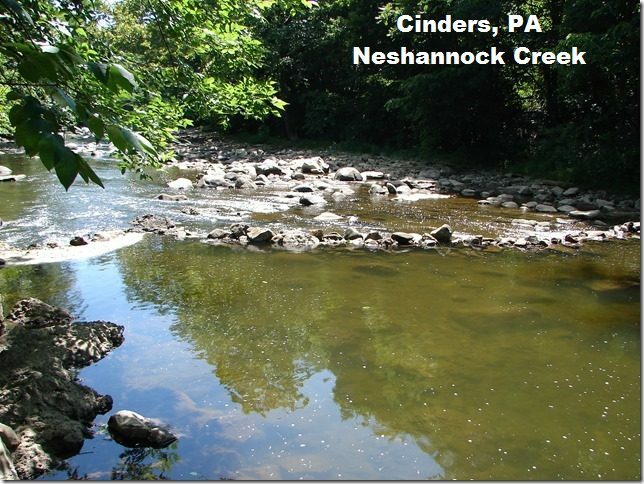 This from a fan: "Cinders is down-stream from the Dillworth (Paper Mill) Bridge. You can see it from the bridge. It�s actually along the old railroad track path or you can come in from the other side of the creek by crossing the bridge on Dillworth and turning left on Neshannock Ave and to the left again toward the creek. This is actually my favorite swimming hole. Sometimes I can�t go fishing because of the fishermen. That�s the same case with Paper Mill Bridge. More people fish than swim at Paper Mill nowadays anyhow. This is almost as deep as Horsefly. There's plenty of room to roam around here." PHOTO ,PHOTO , PHOTO. LAT,LON lat=41.01310, lon= -80.33049(source: map) (accuracy: approximate) LINK TO GOOGLE MAP.Pretty confident. Not verified. Updated 11/2013. Sliding/swimming place in Ohiopyle in the vicinity of the Youghiogheny River, which is a major (and crowded) whitewater river. For details, see DIRECTIONS below. At Ohiopyle S.P. nearby. Get reservations if it is rafting season. 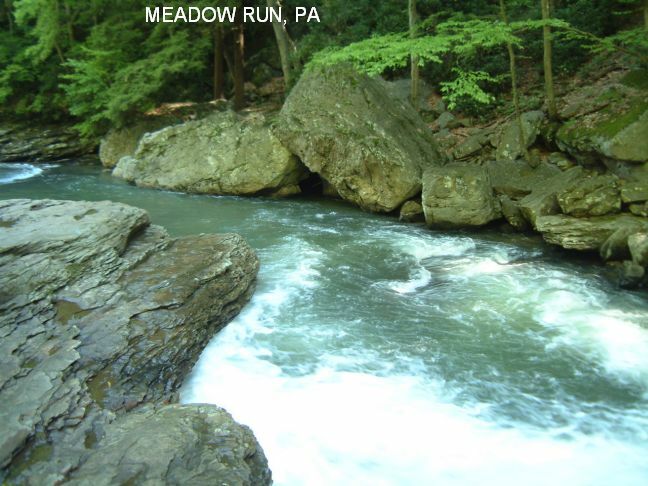 MEADOW RUN SLIDE [MEAD] Natural waterslides that you can slide down boulders into a small pool below. PHOTO 1 , PHOTO 2 , PHOTO 3 , PHOTO 4. To get here: Just as you enter Ohiopyle from the south on RT 381, see the large gravel parking area for the slides on the right just before you cross major concrete bridge where Meadow Run enters the Yough River. There is a sign on the left and the bottom entry on the sign is "Natural Waterslides". LAT,LON lat=39.8625,lon= -79.4942(source: measured-p) (accuracy: exact) LINK TO GOOGLE MAP. Very confident. Verified 5/2008. Updated 5/08. Very lovely creek swimming area is formed by weir - see photos. 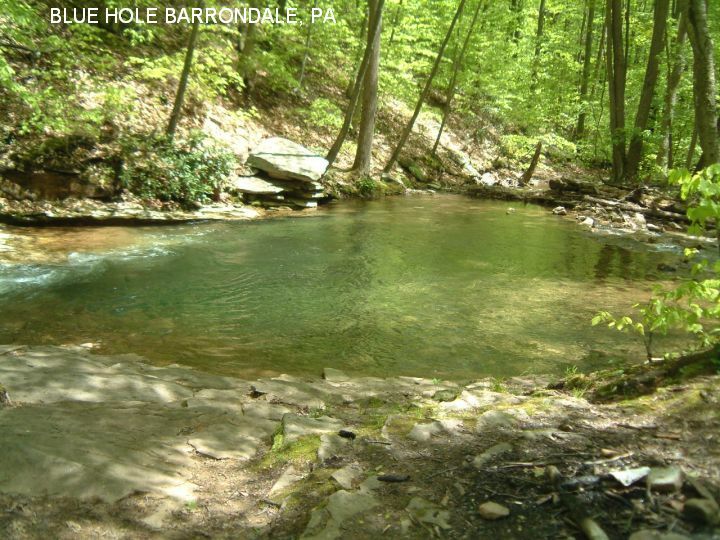 [See also nearby "Galeton" and "Hammersley Hole" swimming places]. A frequent visitor here warns that THERE ARE MANY RATTLESNAKES IN THE CENTRAL PA AREA, BE CAREFUL! DO NOT PUT YOUR HANDS OR FEET ANYWHERE YOU CANNOT SEE FIRST, LIKE UNDER A ROCK OR LOG OR ON A LEDGE. At site; Ole Bull S.P. 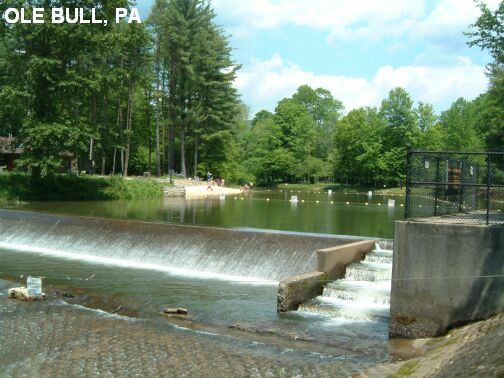 From RT 6 at Galeton, go south on RT 144 to Ole Bull S. P..
Nice swimming/tubing places in river, several deep holes. Pine Creek is also a beautiful canoeing creek in the early spring. 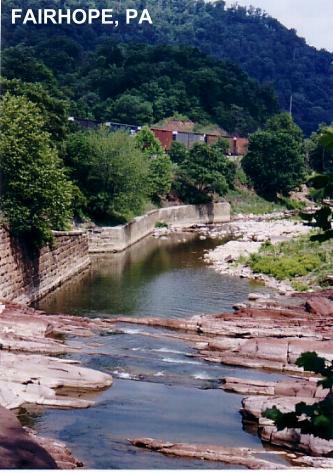 Upstream of here, one can canoe through the area called the Grand Canyon of Pennsylvania. A frequent visitor here warns that THERE ARE MANY RATTLESNAKES IN THE CENTRAL PA AREA, BE CAREFUL! DO NOT PUT YOUR HANDS OR FEET ANYWHERE YOU CANNOT SEE FIRST, LIKE UNDER A ROCK OR LOG OR ON A LEDGE. Little Pine S. P. is nearby. ROADSIDE 44 [ROAS] Deep place in Pine Creek at roadside pull out. To get here: about 7 miles from where you get on RT 44 going north (or, about 3.3 miles going south on RT 44 from Waterville) see on the west (left) side of RT 44 a break in the guardrail and a pull out. Park here and walk down to Pine Creek where the swimming holes is. LAT,LON lat=41.279132,lon= -77.316853(source: Google Map) (accuracy: approximate) LINK TO GOOGLE MAP. Very confident. Verified. Updated 8/08. PINE CREEK [PINE] Deep place in Pine Creek near bridge. PHOTO. To get here: continue north on RT 44 through Waterville. In a short distance past Waterville, just BEFORE you cross the bridge over Pine Creek, park alongside the road (safely). Walk down to the creek near the LEFT side of the bridge (stay near the bridge, there is private property nearby). The swimming places are right here near the far side of the Creek. These are several deep holes and large rocks underwater, be careful. LAT,LON lat=41.311310,lon= -77.376640(source: Google Map) (accuracy: approximate) LINK TO GOOGLE MAP. Very confident. Verified. Updated 8/08. Large but shallow swimming area in creek near road - not too deep. Popular with local kids. None at site, camp nearby at Hills Creek S. P.
From Mansfield(north of Williamsport, near NY state line), take RT 15 south to Blossburg then take Main St. (becomes Gulick St.) southeast. Bear right on Ogdensburg Rd. and go about 2.8 miles to an unsigned dirt road on the left side of the road. Turn into this dirt road and park and walk along the road, though a small stream, a total of less than 10 minutes to a large clearing on the left with signs of past campfires. The swimming hole is here. Multi-level falls you can stand under and maybe swim below if it is deep enough. Very close to the PA/OH border. The falls are just before Quakertown Creek empties into the Shenango River. See Web Site. Shenango COE campground north of here. From downtown New Castle, take RT 224 west (Falls St. then State ST.) about 10 miles (across I-376 and across the Shenango River.) 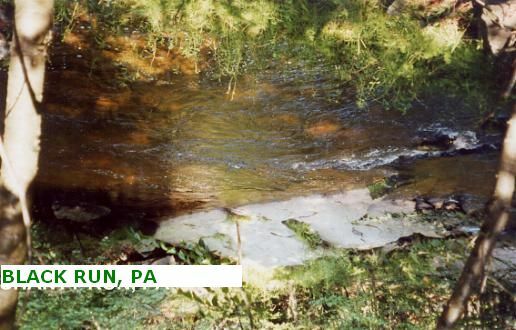 RT 224 then crosses Quakertown Creek upstream of the falls (the waterfall is not visible from the road). Park on the wide dirt shoulder on the right (north) side of RT 224. There are no official trails here but it is easy to see the different routes people take down to the falls. You can easily walk up to the top of the falls. It is a short, steep, walk down to the bottom of the falls. May not have much water late in the Summer, probably best in the spring. Established swimming, beach, lifeguards, falls, cold water. At site, reservations, call 570-966-1455. From I-80 Exit 185 (southwest of Williamsport, near Rosecrans)take RT 477 south about 7 miles to Livonia, then take RT 192 east (left turn) about 5 miles to signs for R.B. Winter S. P.. Swim in lake at park. Alternately, from Lewisburg, go west on RT 192 about 20 miles to park. Many waterfalls on 2 creeks. 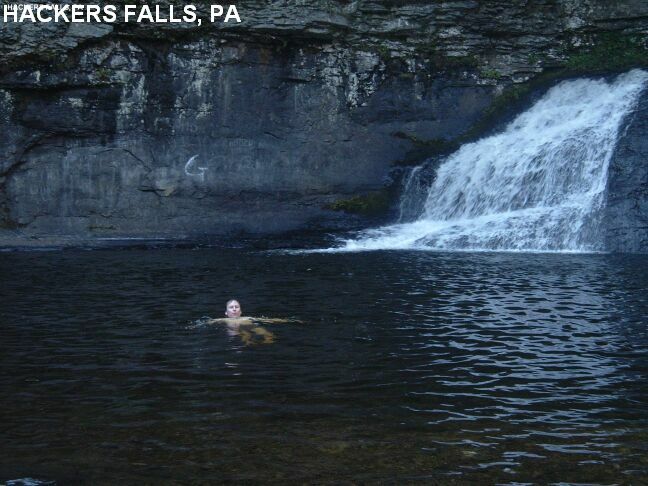 Adams Falls, right on RT 118, has a very nice pool at the bottom with gradual entry. PHOTO 1 , PHOTO 2. Also lake swimming at the State Park. 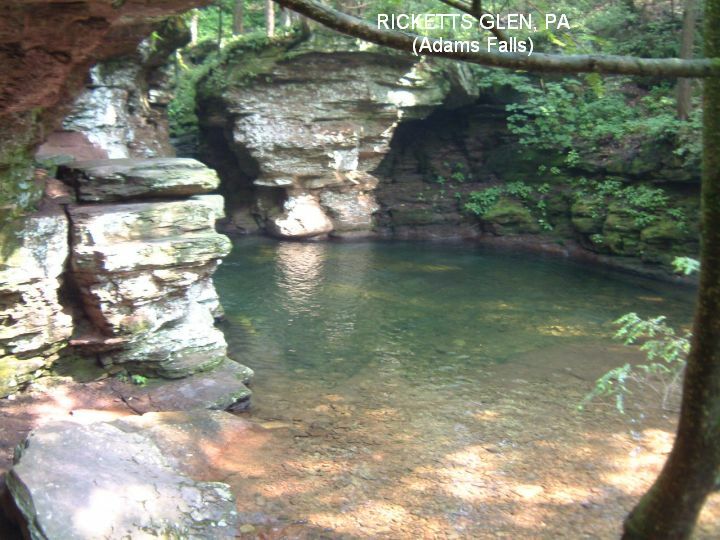 I received the following e mail from a state official in 7/2003:" Please be advised that on your website under Pennsylvania you list an area called Ricketts Glen State Park. This is a Natural Area, is remote, and swimming is strictly prohibited by law. We are asking for your help by removing this listing. We do not want to see people get fined or arrested, and more importantly injured or killed swimming in these waterfalls. We have serious injuries occurring in this area, and are trying to protect the people and the environment. 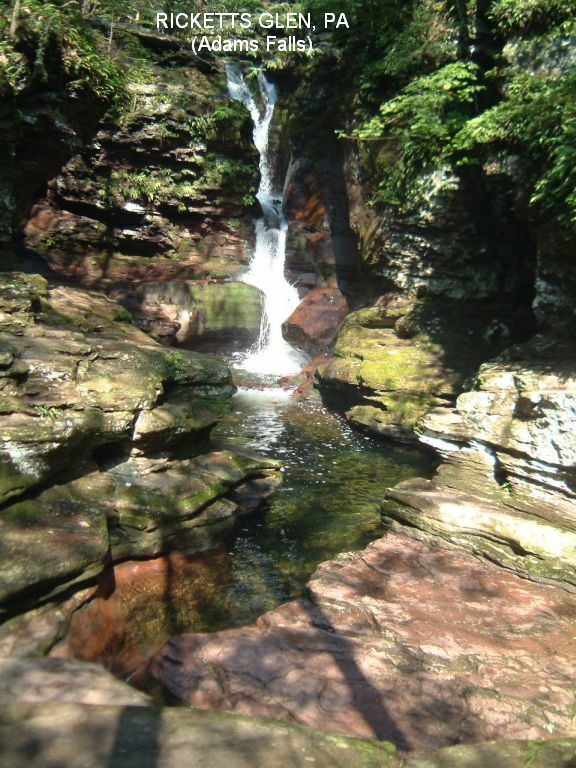 Signed: Terence Daltroff, Park Manager, Ricketts Glen State Park." At site; Rickett's Glen S.P. From Wilkes-Barre, take RT 309 north then RT 118 west to the State Park. Very beautiful swimming spot, but rather remote. It has been used as a swimming hole for years and lays between two reservoirs. The upper reservoir is still active but the lower one is not. This swimming hole is big with many pools up and down the creek. Be careful of rocks and the moss. The rock moss is very slippery, so be sure you have a solid footing when walking around. Because the area has rugged access, don't drive down here unless you have a reliable 4wd vehicle. One final note: Even though it's not posted, the area is private property. So if you bring food and drinks with you, please take your garbage with you when you leave. If not, the owner may block access and we would be losing a very nice area. From Scranton, take RT 307 south for about 5 miles. Turn left on Blue Shutters Rd. Follow for about 1 mile and turn left on Elmhurst Blvd, just before the I-380 underpass. Follow Elmhurst Blvd for about 1.5 miles and you will see a small guardrail on each side of the road. About 0.1 mile past that, is a dirt road on the right. You can park there. It is a 15-20 minute walk down the hill (past a lot of debris) to the creek. (The walk back uphill is about 30 minutes.) After you cross the creek (it is shallow here), turn left and you have to walk more until you find the swimming spots .watch for the 1st dirt road on the right. Follow the dirt road all the way down until you reach the creek. One word of caution, do not swim by the dam at the lower reservoir, this area is OFF LIMITS and you will be arrested if caught there. 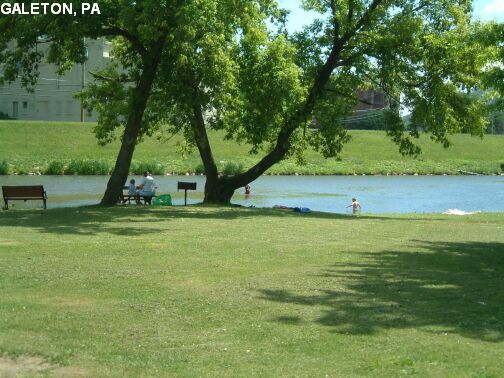 Long-time swimming hole in Montour Run near the Montour Trail not far from Robinson Mall, the airport and other commercial development. As of June 2015, it has been reported that that many trees and the rope swing that were once here have been cut down and swimming here is no longer desirable. West of Pittsburgh, take the Airport Pkwy (I-376) to Exit 58 (near Robinson Towne Center Mall) and merge onto Montour Run Rd. going east. Continue to the next trailhead for the Montour Trail, near Fedex Dr.. 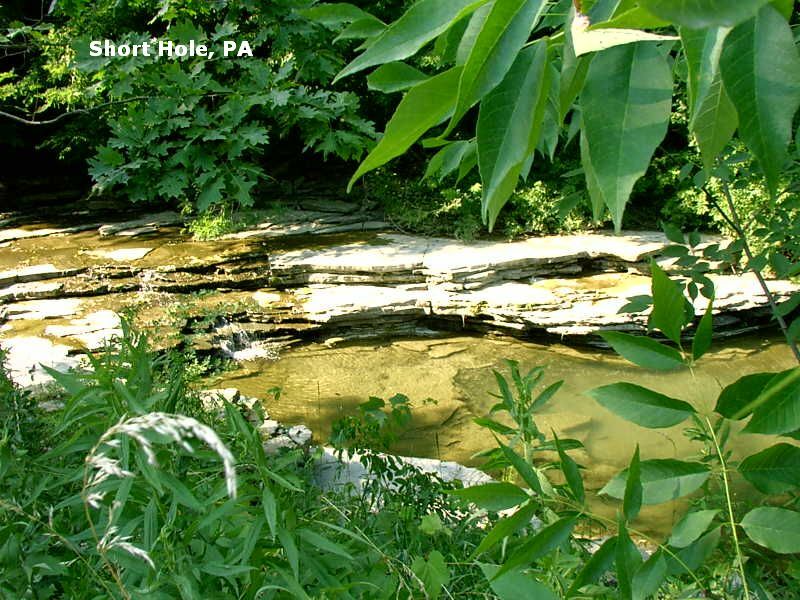 Hike the trail northeast a short way (maybe .5 mile) to the swimming hole which is in Montour Run just off the trail (you can see the Costco over the trees from the swimming hole � it is not a very rural setting). Don't know the exact location. Swimming holes in beautiful Rock Run creek in Tidaghton State Forest. See "DIRECTIONS" below for details. THERE ARE MANY RATTLESNAKES IN THE CENTRAL PA AREA, BE CAREFUL! DO NOT PUT YOUR HANDS OR FEET ANYWHERE YOU CANNOT SEE FIRST, LIKE UNDER A ROCK OR LOG OR ON A LEDGE. 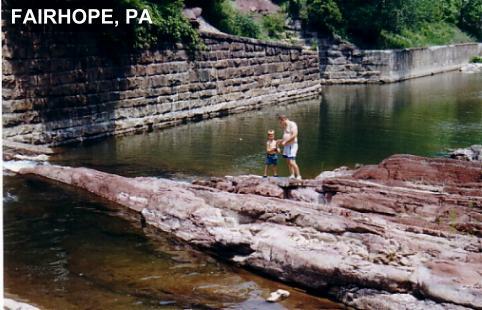 LOVERS ROCK [LOVE]: Swimming hole beneath large, flat rock outcrop. Depending on the intimacy level of any lovers present, bathing suits may be optional. To get here from the bridge at Ralston, go .8 miles up Rock Run Rd. (keep right at fork) and park in large pullout area on right. It is a short but steep climb down to Lovers Rock and the swimming hole. LAT,LON lat=41.5053,lon= -76.9373 (source: measured) (accuracy: exact) LINK TO GOOGLE MAP. Very confident. Verified 6/07/05. Updated 6/09/05. 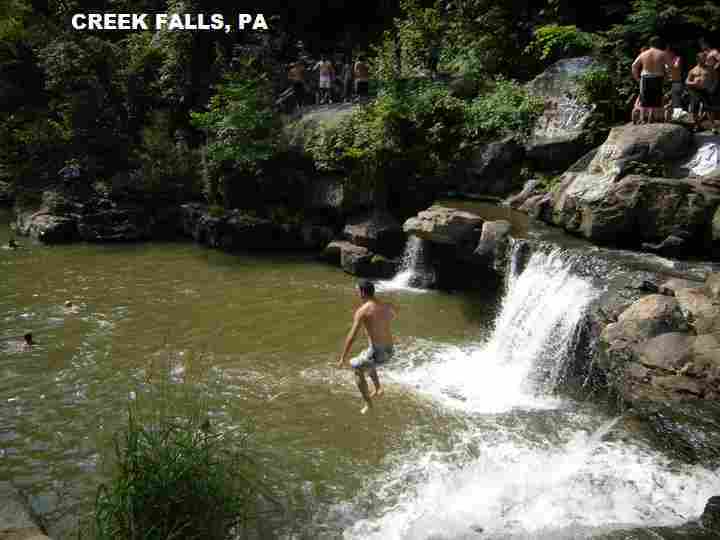 ROCK RUN FALLS [ROCF]: Swimming hole at bottom of chute/cascade through rock crevice. beneath large, flat rock outcrop. YOUTUBE . Bathing suits may be optional. To get here from Lovers Rock (above), continue for 1 more mile on Rock Run Rd. and park at pullout on left or right. Walk a short way down the trail to the creek then walk downstream a short distance to the swimming hole. LAT,LON lat=41.51465,lon= -76.9196 (source: measured) (accuracy: exact) LINK TO GOOGLE MAP. Very confident. Verified 6/07/05. Updated 7/2010. From Mansfield (north of Williamsport, near NY state line) take RT 15 north to Lawrence then RT 49 west. 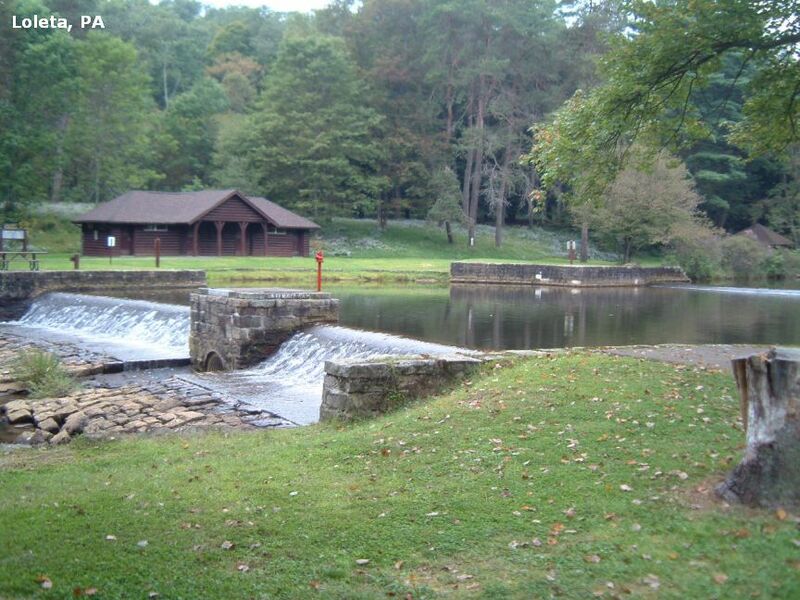 Go past the Cowanesque Dam, where you will see a recreation area with official lake swimming at a beach. About 3-4 more miles on RT 49 west of the recreation area, where the river feeds into the lake, is the Neslon Falls area and a bridge over the river. Just before you cross the bridge here, (just east of the bridge), you turn south (left) onto Thornbottom Rd.. Take this road to the first right turn onto Pleasant Valley Rd., turn right and go about .3 mile up this road to where there is a weathered barn on the left and on the right is Short Hole, almost visible from the road. On New Jersey side there are several State Parks with camping. 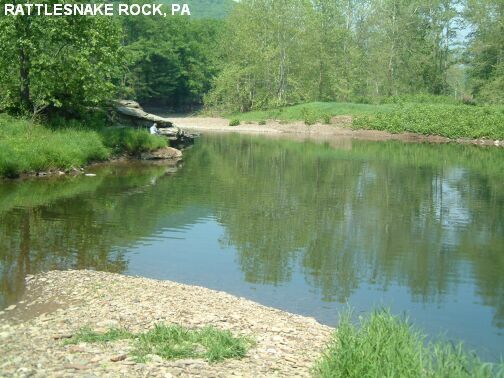 RED ROCK [REDR] Local swimming hole in Brodhead Creek. Has a rocky beach, bridge, 20 feet deep in certain places. Swimming, jumping, rope swing. PHOTO . This note from a visitor in 2007:"The Red Rock site is still there and is a nice spot, sometimes trashed with beer cans. There is only one jump from the lower platform of the bridge that I was willing to do, everything else seemed either too high a jump, or too shallow water. The rope swing is truly insane, with the bottom of the rope at least 25 feet above the water. It looks like the water would be deep enough for it, but it would take someone braver than I to try it." Camp at Tobyhanna S. P. northwest of here. LAT,LON lat=41.05396, lon= -75.22098 (source: measured) (accuracy: exact), LINK TO GOOGLE MAP. Very confident. Verified 8/08. Updated 7/2010. We received this report in 7/2010:"The area on the train tracks and bridge is now posted as no trespassing by the railroad company. It seems that it is still OK to jump off the cliffs or use the rope swing, but it doesn't seem legal to jump from the bridge anymore (or walk along the tracks). That said, there were people there jumping from the bridge that frequent the area and they informed our group that the new restriction is rarely enforced. 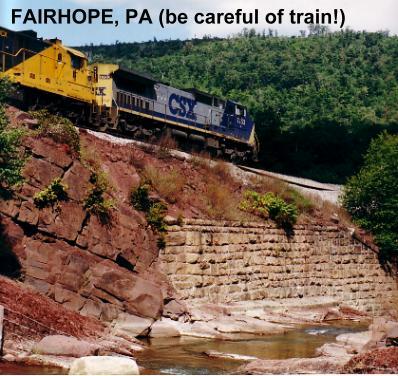 It seems the signs may have been posted only to reduce the liability of the railroad company." To get here from RT 209 in Stroudsburg (see directions above to here) After you make the right turn onto RT 209, bear left at the first light, this will be RT 447 again. Take RT 447 about 6 miles to the town of Analomink, near the Post Office. Make a left at the Analomink Post Office on Cherry Lane Rd. and follow the road along the tracks, you will see the bridge up ahead. The swimming hole is under the bridge. There are lots of "no parking" signs along here, but if you cross the bridge then on the left there appears to be a section where you could park. If not, you will need to park some distance away and walk to the bridge. The only apparent way to get down under the bridge is to go down on the left side of the bridge as you first approached it. 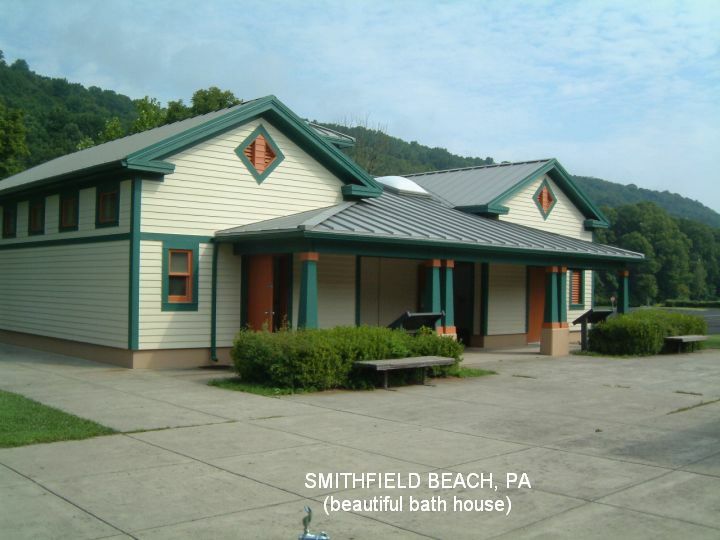 SMITHFIELD BEACH [SMIT] Established Delaware River swimming beach in the Delaware Water Gap N.R.A.. Has elegant changing/bathrooms (see photo), boat ramp, picnic tables, lifeguards. It is clearly marked on the Delaware Water Gap NRA map. PHOTO 1 , PHOTO 2 . LAT,LON lat=41.02948,lon= -75.05232(source: measured) (accuracy: exact) , LINK TO GOOGLE MAP. To get here from Stroudsburg, take I-80 east to Exit 309 where you take RT 209 north. Turn right at Buttermilk Falls Rd/Shawnee Rd. and turn left at River Rd. (Rt 2028) and follow signs to Smithfield Beach. Very confident. Verified 8/08. Updated 8/12/2008. Local swimming hole in creek, 8 feet deep with rock jumping and rope swing. West of Mansfield at Hills Creek State Park. From Mansfield (north of Williamsport) go east on RT 6 to Troy. From Troy, continue east on RT 6 (Main ST) about 1.4 miles then turn left onto Barrett Hill Rd (RT 532) and go 0.1 mi. Pull off/parking on the left before the bridge over Sugar Creek. The swimming hole is near this bridge. Family place to swim in creek at small park with picnic tables. Gradual sloping bank on south side, good for kids. From Harrisburg, take RT 322 east to RT 39 (Hershey Park Dr.) in Hershey. Take RT 39 west (see signs)and stay on it where it turns left at Hershey Park. Shortly, (after you cross Swatara Creek) you will come to East Canal Rd.- go west (left) onto this road. The next major road you will come to is alternately called Hanover Rd. or Grandview Rd.- go left here. 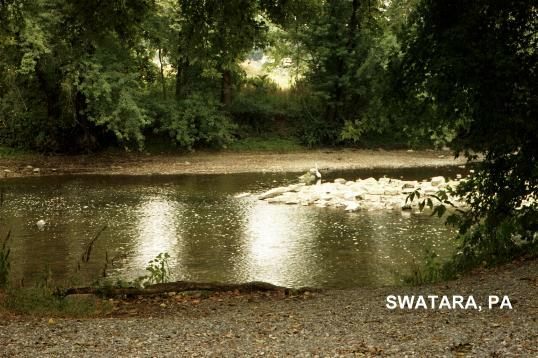 Just before you cross Swatara Creek again is a little park where the swimming hole is in the creek. Local swimming hole in creek near road and railroad. No further details. From Pittsburgh, take RT 8 north toward Butler. About 5 miles BEFORE you get to Butler, (after you pass Airport Rd. on the west (left) side of RT 8) turn left on Renfrew Rd. going toward Renfrew. This road runs along side of Thorn Creek and there is said to be a swimming hole in the creek along here, before you get to Renfrew (we think). It may be accessible from the road or from the railroad on the other side of the road, uncertain. No better directions. Swimming places in the "Outflow" from an Army Corps of Engineers dam which forms Tionesta Lake - it is officially called the "Tionesta Recreation Area". There is an Army Engineers campground here as well as a city park which has a swimming (grass) beach and lifeguard. (NOTE: In a visit here in 7/04, locals said that the swimming beach was not in operation.) It is possible to tube or to play in the water by the campground as well, but it is quite shallow by the campground and not really a swimming place. From Tionesta (in northwest PA, at the southwest tip of the Allegheny National Forest), go south .5 miles on RT 36 to Tionesta Recreation Area. Informal and formal swimming places near Trough Creek S. P.. For details, see DIRECTIONS below. At Trough Creek S. P.
TATMAN RUN [TATM] This is a formal established Army Corps of Engineers beach (no lifeguards) on Raystown Lake and might be a nice alternative to the informal place at Trough Creek (see below). Has picnic areas and changing rooms and a nice sandy beach. No fee. To get here: After you cross the bridge on RT 994 (above) look on your left (north side of RT 994) for a sign for "Tatman Creek Rec. Area." and a road going down to the lake you just crossed. The beach is at the end of this short road. LAT,LON lat=40.31110,lon= -78.179094 (source: measured) (accuracy: exact) LINK TO GOOGLE MAP. Very confident. Verified 7/2008. Updated 7/08. 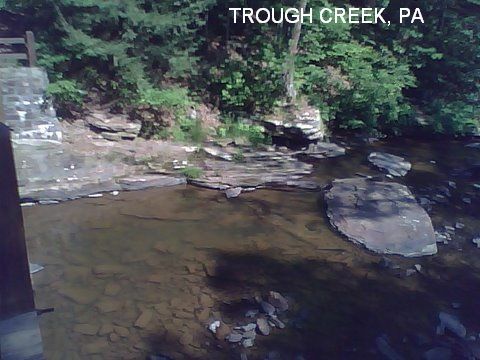 TROUGH CREEK S. P. [TROU] A couple of nice informal water play/swimming places in Trough Creek S, P.. The first one is just below the Swinging Bridge (you will see signs to the swinging bridge and a parking area for it) and has a little rock cliff for low, easy jumping (check for water level and hidden rocks first). PHOTO , PHOTO , PHOTO . LAT,LON lat=40.32233,lon= -78.12945 (source: measured) (accuracy: approx) LINK TO GOOGLE MAP. Another shallow but nice water play area is at picnic area #5, further down the road from the swinging bridge and past the ice cave. LAT,LON lat=40.33105,lon= -78.12572 (source: measured) (accuracy: exact) LINK TO GOOGLE MAP. To get here, continue east on RT 994 and follow the signs for Trough Creek S, P.. Follow the road along the creek until you come to the swinging bridge and then to picnic area #5. The camping is on this road also. Very confident. Verified 7/2008. Updated 7/08. Swimming hole in French Creek. This from a visitor: "Overall: very quiet, very secluded, very beautiful! The water ranges from knee-deep to about 5 feet deep in spots. The highlight is the giant rope swing on the other side of the creek. It's hung from a very high branch and seems sturdy; it held my 180-lb fiance without issue. It's too high up, however, to see how good the knot is, so always be careful! You can swing off the ground, a wooden platform, or a ladder that's nailed to a tree. I recommend the ladder -- it seems sturdier than the platform and it's attached to the tree quite well. If you swing off the platform, be careful not to let go over a large boulder that sits a little more than halfway across the creek. Swinging off the ladder sends you into a safer trajectory -- there are no large rocks in the way. None at site. Camp nearby at French Creek S. P.
From Phoenixville, take 2nd Ave west then turn right on Nutt Rd then left onto RT 113 (Kimberton Rd). Stay on Kimberton Rd. and keep right at the fork onto Pughtown Rd then turn left when you come to Frenchtown Rd. (do not continue on Pughtown Rd. over the creek bridge). If you continued on French Creek Rd. you would come to Beaver Hill Rd.. The swimming hole before Beaver Hill Rd., almost exactly halfway between the intersections of Pughtown Rd. and Beaver Hill Rd. The pull off to park is on the south (left) side of the road, the creek is on the north (right) side. There are signs for "West Vincent Township Park" (although there's no real park nearby - just the creek). Pull off to the side and cross the road (there's virtually no traffic) and hop right into French Creek. 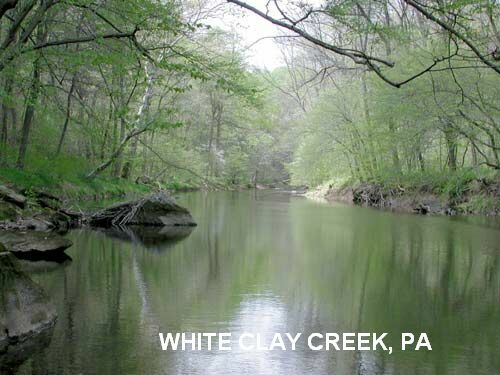 Right on the PA/DE state line, the White Clay Creek State Preserve offers a beautiful, quiet spot for swimming, tubing and canoeing along White Clay Creek. 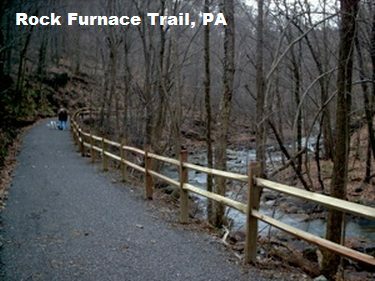 The foot path is part of Mason Dixon Trail that connects both parks (PA and DE). PARK WEB SITE . From I-95 in Delaware, take Exit 1 (RT 896) north to Newark, DE. From Newark, continue north on RT 896, New London Rd.. Past the main entrance to White Clay State Park take a right on Hopkins Rd, left on Thompson Station Rd and then left on Chambers Rock Road. Cross the bridge and there is a small state park parking lot on the right. Walk north along the creek for approximately 1/2 mile. You'll cross the state line into the PA portion of the park. Pass an abandoned railroad bridge foundation works. Along the path for the next 1/2 mile there are a number of swimming spots. 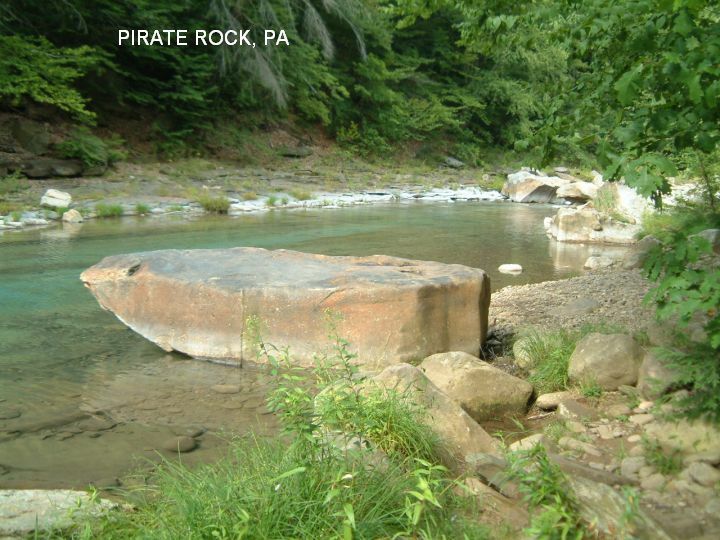 Look for the big flat rocks that will give you easy access to the lazy wide river. Suitable for kids but be careful the rocks can be slippery. You may want to bring a length of rope and tie it to a tree to help you get in and out of the water. Commercially-operated quarry with very clear, very deep water. Swimming beach, platforms, also popular scuba diving place. All facilities. JOIN THEM EVERY NEW YEARS DAY FOR THEIR ANNUAL POLAR BEAR SWIM (all proceeds to charity.)! Link to web site. At site for divers only. From Harrisburg, take RT 422 east (or, take RT 501 south from I-78 then RT 422 east.) In 3 miles past Meyerstown, look for Willow Springs sign on the right. Turn right on to Millardsville Road (sign says to Richland). Park is .5 miles on the left. Fourmile Creek runs through Wintergreen Gorge near the Behrend Campus of Penn State near Erie. This from a visitor:" There are a series of pools, jumping places, one with a rope swing. The creek walk is a beautiful hike on a hot day. Ask other people swimming/hiking about holes. We usually park behind engineering, walk down to the gorge, (steep, on an old service road, about 1/2 mile) and then walk in the creek upstream to visit three holes and then turn back. We can do that in 1 1/2 hours, no problem. Loose shale gorge walls are not for climbing! Water level changes throughout the summer, can dwindle during late July and August - still enough for a dip, but not enough for any jumping. Just because crazy college kids are jumping doesn't mean it is a good idea - check depth, rocks, etc. Lots of families hike the gorge, but in the evening you will encounter more college students who are having a great time, but not necessarily modeling great behavior for your younger kids"
3) Turn left into the Behrend Penn State Campus and park behind the engineering building complex by following the Behrend College Drive road through campus, all the way to the parking lots at the back. (42.12009,-79.98894) During the work day - 8-5 - you generally need a parking permit for the campus, but this is not an issue on weekends or evenings. There are good, well trodden trails to the gorge. If you park on the campus, the swimming holes are still a bit upstream from where the trail gets you down close enough to access the creek. Yellow Breeches Creek has lots of tubing and some small swimming places. This from a visitor: "Pretty cold but it's great for tubing. There are some swimming holes too. The creek starts in Boiling Springs and converges with the Susquehanna River at New Cumberland. You can tube and swim at many spots along there. There is even some parking here and there. Please refer to this website (follow outdoor > boating link)for additional information including parking. Keep in mind, though, there are a lot of places along the Breeches that you can go that aren't necessarily listed." Another note from a visitor: "Yellow Breeches has canoeing and tubing, plus swimming in spots and fishing for much of its length. 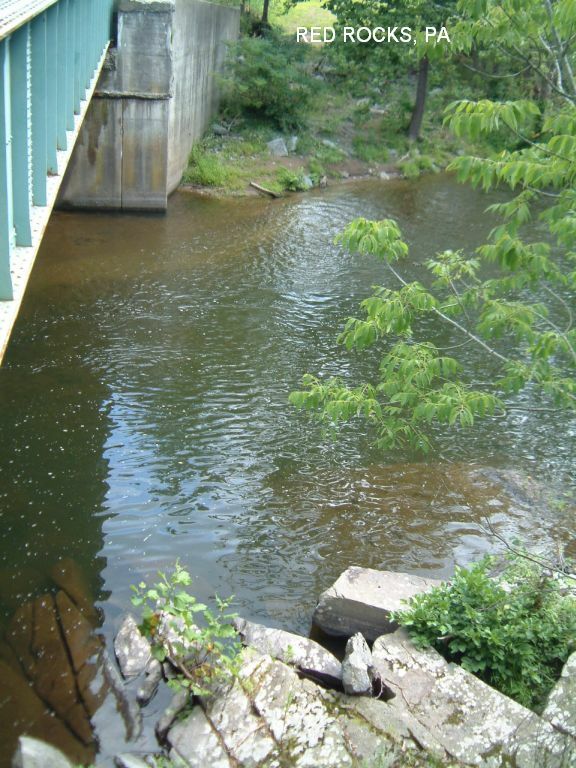 Swimming is more confined to deeper areas above and below dams, like Brandtsville, where Route 74 crosses the Yellow Breeches. It is my understanding that tubing and canoeing can be undertaken from Brandtsville through Williams Grove and Grantham to the Upper Allen Park at McCormick Road. There may be ducks present here - to avoid intestinal duck worms, stay away from the ducks, especially in still water like lakes and ponds." From RT 15 (south of the PA Turnpike) take the Lisburn Road exit. Go east on W Lisburn Rd (RT 114). Go south (right) onto McCormick Rd. This road will parallel the creek. Tubing and swimming places are along here.